BID DUE TIME: 5:00 P.M. Receive bids for disassembly of 3 Iron bars (1st floor), 3 French balconies (2nd floor) and 1 Overhang (main entrance, 1st floor), and loading into the container for shipment. Bids will be opened by the Embassy committee. Bids received after closing time will be declined. Notice of the award of contract shall be given by the Embassy within seven days from received approval from the Ministry of Foreign Affairs of the Republic of Serbia.Bids shall be guaranteed for a period of thirty (30) days after the opening of bids. 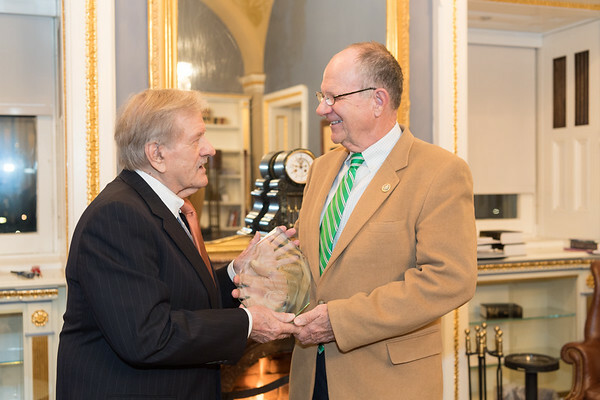 Washington D.C, December 4, 2018 - David Vuich, Chairman Emeritus of the Tesla Science Foundation presented Ted Poe with an engraved trophy in appreciation of the Congressman's valued support to the Tesla Science Foundation. During the past several years, Mr. Vuich has interfaced with the Congressman and his professional staff in an attempt to submit a formal request to the Director of the Smithsonian to recognize and consider a dedicated Tesla exhibit at the Museum. As a result of a Congressional Dear Colleague letter, the Smithsonian has agreed to establish a dialogue with the Tesla Museum in Belgrade in order to determine available artifacts that may be available for display. At its meetig on Ocober/8/2018, the Government of the Republic of Serbia adopted the Decision on the termination of the Decsion on visa exemption for the nationals of the Islamic Republic of Iran, holding ordinary passports.The decision is published in the "Official Gazette of the Republc of Serbia" No. 75/2018 on October/9/2018 and enters in force on October/17/2018. From that date, citzens of the Isamic Republic of Iran, holders of ordinary passports, for entry, transit and stay on the teritory of the Republic of Serbia, need a visa. Washington D.C, August 11th, 2018 – Washington D.C. Department of Parks and Recreation organized a soccer tournament called “DC Embassy World Cup” that took place concurrently with the World Cup in the Russian Federation. The tournament was supported by the Embassy of the Russian Federation and Washington D.C. Mayor Ms. Muriel Bowser. Our team, which consisted of the players from Serbian diaspora and from the Embassy of Serbia, won the first place. Sixteen different embassies participated in this football tournament in which groups were formed in accordance with the World Cup in the Russian Federation. During the group phase, the Serbian team won two and lost one game. Nevertheless, one loss in the group phase did not prevent our team to be dominant in the playoff stage and beat Peru, Uruguay, and Brazil before reaching the finals of this prestigious tournament. Due to the poor weather conditions, the finals were postponed a few times until finally scheduled to be played in the Jellef Recreation Center on Sunday, August 11. In the third place game, Brazil was able to beat France and finish as third in the tournament. In the final game, Serbian team faced Argentina. During an uncertain and exciting game, Serbia was able to win with the final score of 4-1. The winning trophy was handed by one of the Washington D.C. officials. Other awards and recognitions were also handed during the final ceremony. The Embassy of the Republic of Serbia would hereby like to thank and congratulate all the players who contributed to this enormous success. 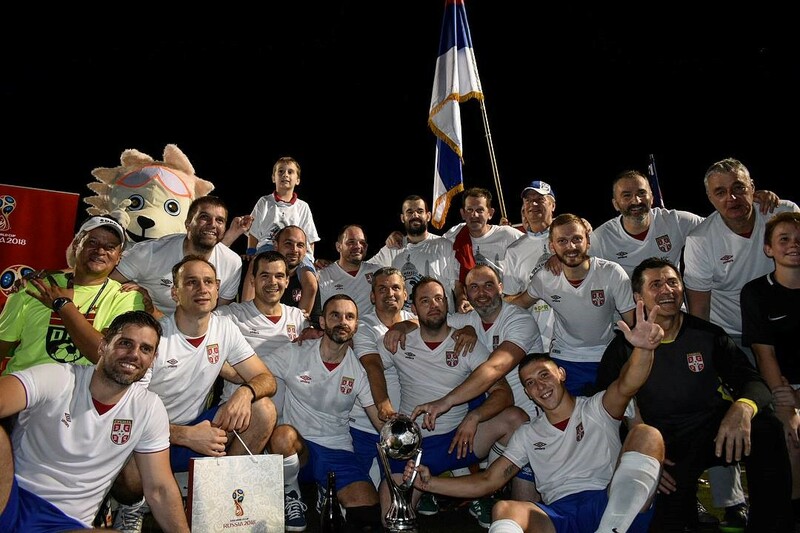 With that being said, the Embassy would also like to thank Serbian Ministry of Foreign Affairs and the Football Association of Serbia for providing national jerseys for the Serbian team. Washington, D.C, 27th July 2018 - First Deputy Prime Minister and Minister of Foreign Affairs Ivica Dacic was on a two-day visit to the U.S., to attend the Ministerial Conference dedicated to religious freedoms and the ceremony marking the hundredth anniversary of flying the Serbian flag over the White House. Washington, D.C, 25th July 2018 - First Deputy Prime Minister and Minister of Foreign Affairs of the Republic of Serbia Ivica Dacic, together with Serbian Prime Minister Ana Brnabic and Prime Minister of the Republic of Srpska Zeljka Cvijanovic, participated in a ceremony held at the United States Congress to mark the 100th anniversary since the Serbian flag flew over the White House. Washington, D.C, 24th July 2018 - First Deputy Prime Minister and Minister of Foreign Affairs of the Republic of Serbia Ivica Dacic, who is on a two-day visit to the United States, met in Washington, D.C. with U.S. Assistant Secretary of State for European and Eurasian Affairs Wess Mitchell. In the talks, both sides confirmed their readiness to strengthen bilateral relations. The collocutors also noted the readiness to work jointly on regional stability, as well as the need for a negotiated settlement of the Kosovo and Metohija issue. Washington D.C, Jun 30, 2018 – Concurrently with the World Cup in the Russian Federation, the DC Department of Parks and Recreation is organizing a football tournament called “DC Embassy World Cup”. The tournament hosts those foreign embassies in Washington DC area that represent countries participating in the World Cup. 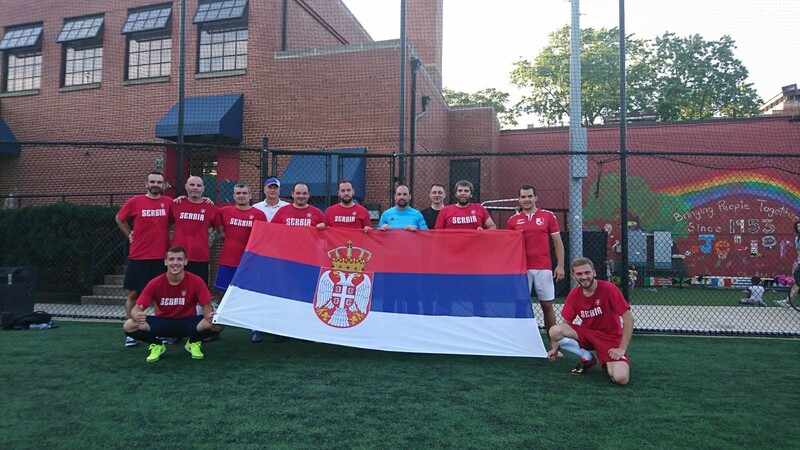 In the third game played on Saturday, June 30, 2018, the Embassy of Serbia team, strengthened by representatives of Serbian diaspora from Washington D.C. and the surrounding areas, was able to beat the Embassy of Brazil with the score of 5-2, thus qualifying for the final round of the tournament, which will symbolically end on July 14, 2018. This year's Festival titled "The Orfelin Circle Presents: Serbian Contemporary Short and Documentary Film - Washington 2018" will be held at The Avalon Theater, 5612 Connecticut Avenue, NW, Chevy Chase, Washington, D.C. on June 10th, 2018 at 8 pm. Movies are with English sub-titles. Detailed information about the program can be found at the website: www.orfelin.org. Belgrade, May 24th, 2018 - Defence Minister Aleksandar Vulin has met today with US Congressman Brigadier General Steven Stivers from the Ohio National Guard, who is visiting the Republic of Serbia. The two interlocutors discussed the continuation of the development of bilateral military cooperation, with emphasis on cooperation within the framework of the Serbia–Ohio National Guard State Partnership Program, which lasts more than 11 years. Los Angeles, 23rd April 2018 - In the presence of State Secretary of the Ministry of Foreign Affairs of the Republic of Serbia Nemanja Stevanovic, the Consulate of the Republic of Serbia headed by Honorary Consul Mr. Ryan F. Osborne, M.D. was formally launched in Los Angeles on 21 April 2018. The Consulate of the Republic of Serbia in Los Angeles will have consular jurisdiction in the territory of the federal state of California. 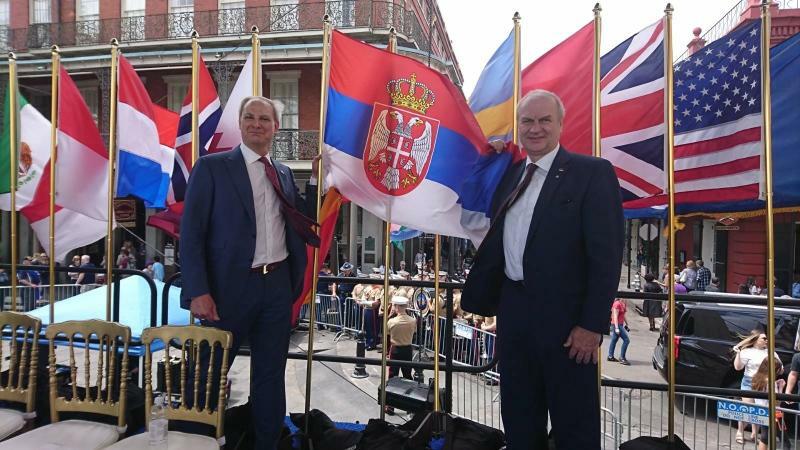 New Orleans, 20th April 2018 – At the invitation of the Mayor of New Orleans Mitch Landrieu, the Ambassador Djerdj Matkovic attended the City’s Tricentennial celebration. 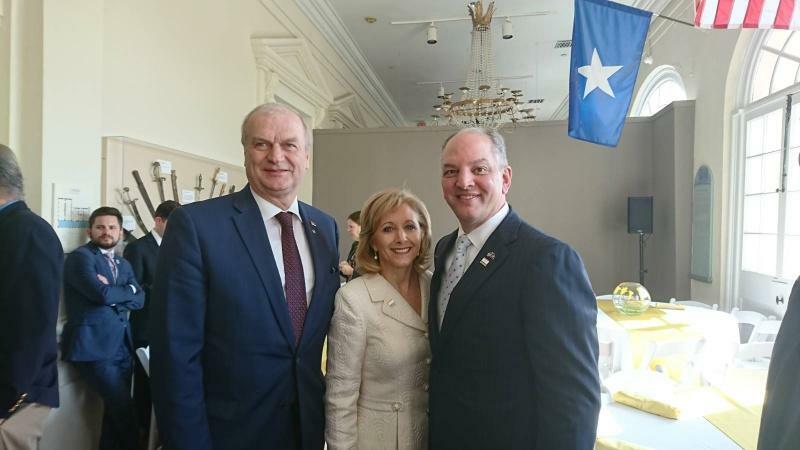 During his visit, the Ambassador met with Louisiana Governor John Bell Edward, the Honorary Consul of the Republic of Serbia Greg Rusovich, and the representatives of the Serbian diaspora. Belgrade, 20th April 2018 - State Secretary in the Ministry of Foreign Affairs of the Republic of Serbia Ivica Toncev had talks today with U.S. Ambassador to Serbia Kyle Scott and U.S. Ambassador to Croatia Robert Kohorst. During the talks, the State Secretary emphasized that the relations between Serbia and the United States were of extreme importance to our country. He underlined that Serbia was firmly committed to EU membership and that it was investing efforts towards regional stability and development. U.S. Ambassadors were interested in the bilateral relations between Serbia and Croatia and the State Secretary provided a detailed account thereof, pointing out that a number of joint commissions and committees had been established to deal with the bilateral issues. State Secretary Ivica Toncev told his collocutors that Serbia's primary goal was to maintain peace, stability and safety of the Western Balkan region to which we contributed by our constructive approach and would continue to do so in the future as well. He emphasized that the relations between Serbia and Croatia were of crucial importance to the regional stability and that incidents such as the one during the visit of the Members of the Croatian Parliament to the National Assembly of the Republic of Serbia should not be heeded. He said that during his recent visit to Zagreb President Vucic was also exposed to even more offensive acts but still did not cut short his visit which was surely good since it invigorated the dialogue between the two neighboring countries. The collocutors agreed that good relations between the Republic of Serbia and the Republic of Croatia were of particular importance to the lasting stability of the Western Balkans. Belgrade, 5th April 2018 - State Secretary of the Ministry of Foreign Affairs of the Republic of Serbia Nemanja Stevanovic has met today with Acting Deputy Assistant Secretary of State of the United States Matthew Palmer and with US Ambassador to Belgrade Kyle Scott. State Secretary Stevanovic criticized attacks by the Pristina police against Serbian officials and civilians in northern Kosovo and Metohija, saying they were unacceptable. He recalled the constructive role that the Republic of Serbia had played in the dialogue so far, as well as non-fulfillment of the commitment by Pristina concerning the establishment of the Community of Serb Municipalities. Acting Deputy Assistant Secretary of State Matthew Palmer condemned the rise in tensions and assessed that the continuation of the Brussels dialogue and the implementation of the agreed was of key importance, being a proper way of securing stability and peace, which was in the interest of all sides. The two interlocutors also discussed the current situation in the Western Balkan region. In that context, they emphasized the importance of continued dialogue aimed at solving all outstanding issues, as the road leading to prosperity of the countries in the region. The US collocutor reiterated strong US support to the process as well as to the continuation of Serbia's path towards full EU membership. 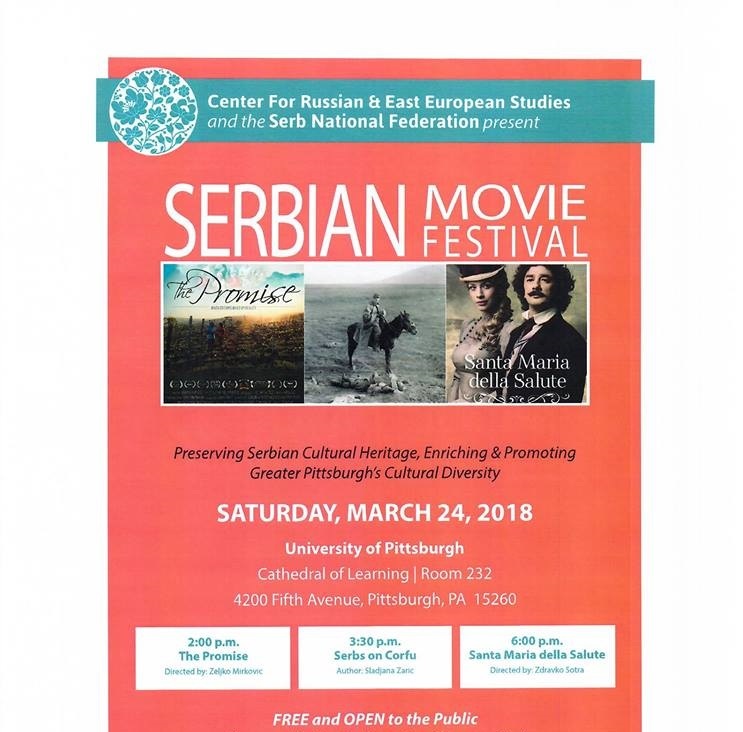 Pittsburgh, 24th March 2018 - The Serb National Federation, the Center for Russian and East European Studies at the University of Pittsburgh and the Radio Television of Serbia successfully organized the Serbian Movie Festival at the University of Pittsburgh for the third consecutive time. Three films were shown at the Festival: "The Promise," "Serbs on Corfu" and "Santa Maria della Salute." At the formal reception, the president of the Serb National Federation John Martich, co-chair of the Department of Slavic Languages and Literatures at the University of Pitssburgh Nancy Condee and the cultural outreach coordinator of the Serb National Federation Milos Rastovic addressed the audience, which included representatives from the film industry, academic community and the Serbian diaspora. Washington, D.C, 23rd March 2018 – The Embassy of the Republic of Serbia in Washington D.C. participated in the Francophonie Cultural Festival in Washington, D.C. The Festival traditionally takes place in March since 2001. Collector of traditional Serbian folklore objects Biljana Regan presented Serbian national costumes, artefacts and handicrafts in the final ceremony held at the French Embassy’s Cultural Centre on 23 March 2018. Promotional and tourist brochures about Serbia were shown and distributed to the visitors, who were also served rakija (plum brandy), wine and traditional desserts. Young Serbian entrepreneur Dejan Zivanovic displayed the skills of dough and phyllo preparation, which the visitors had the opportunity to master on-site. The demonstration was followed by specialty tasting. 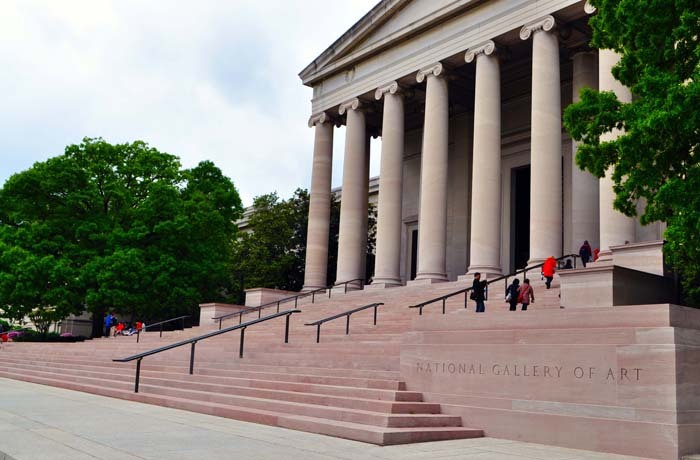 More than 40 Member States and Observers of the International Organization of La Francophonie, including around 1,200 visitors, took part in the event co-hosted by the Embassy of France, a branch of the Smithsonian Institution, and the Alliance Française Foundation. Like in other world cities, this festival celebrates the diversity and richness of the French language, culture and Francophone communities through a number of cultural events and programs. Washington, D.C, 13th March 2018 - First Deputy Prime Minister and Minister of Foreign Affairs of the Republic of Serbia Ivica Dacic met today with US Assistant Secretary of State for Europe and Euro-Asia Wess Mitchell, who is visiting Belgrade as part of his first tour of the region since taking office. 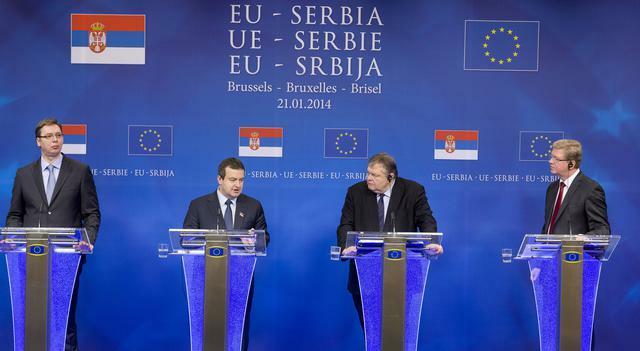 The talks focused on regional stability, Serbia's European path and continuation of the Brussels dialogue. Wess Mitchell said that the US considered Serbia one of the most important countries in the region and the linchpin of the Balkan stability. First Deputy Prime Minister and Minister of Foreign Affairs of the Republic of Serbia Ivica Dacic said that we appreciated the US support and expressed an interest in continuing positive dynamics in the development of bilateral relations in the future as well, especially in the context of 100th anniversary of flying the Serbian flag over the White House to commemorate US alliance with Serbia. Assistant Secretary of State Mitchell pointed out that the United States was consistently supporting Serbia's European path and the progress made within the Brussels dialogue. In order to renew traditional ties of alliance and friendly relations and further step up cooperation and mutual understanding, First Deputy Prime Minister and Minister of Foreign Affairs of the Republic of Serbia Ivica Dacic presented Assistant Secretary of State Wess Mitchell with the message of US President Woodrow Wilson, on the occasion of St. Vitus Day (Vidovdan), entitled "Celebrate Kosovo as a day of honor", published in the New York Times on June 19, 1918. Washinton, D.C, 18th February 2018 - First Deputy Prime Minister and Minister of Foreign Affairs of the Republic of Serbia Ivica Dacic talked today with US Senator Ron Johnson, who is paying a visit to Belgrade. The Serbian Foreign Minister and Senator Johnson talked about the time-honoured friendship between the United States of America and Serbia, and about the importance of the relations for both countries and for the region, too. Today's meeting also discussed possibilities for strengthening bilateral ties, especially in the light of marking 100th anniversary since the then President Woodrow Wilson ordered that the Serbian flag be hoisted over the White House. Interlocutors also exchanged views on the situation in the region and on the importance of the role played by the Republic of Serbia in the promotion of peace and security, for the region and Europe alike. Senator Johnson expressed an interest on the part of the United States to assist Belgrade in finding a long-term solution in relations with Pristina. The Senator suggested that the past should not be forgotten but forgiven and left to the past, and that the focus be on the future. He called on both sides to seize an historic opportunity for progress in the normalization of their relations. Minister Dacic reaffirmed Serbia's readiness to invest efforts in finding a lasting solution that would be in the interest of both sides and aimed at regional stability. 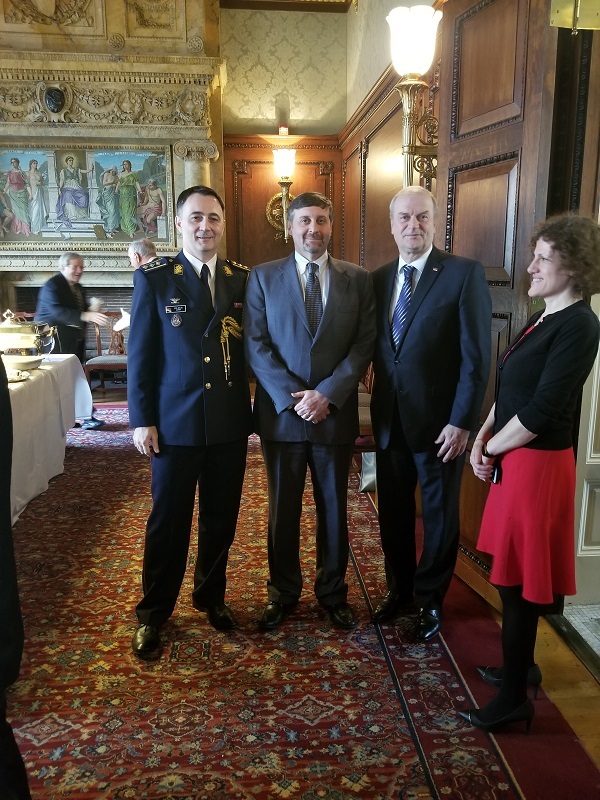 Washington, D.C, 15th February 2018 – The Embassy of the Republic of Serbia and the Defense Attaché Office in Washington organized a formal reception in honor of the Statehood Day and the Armed Forces Day of the Republic of Serbia. 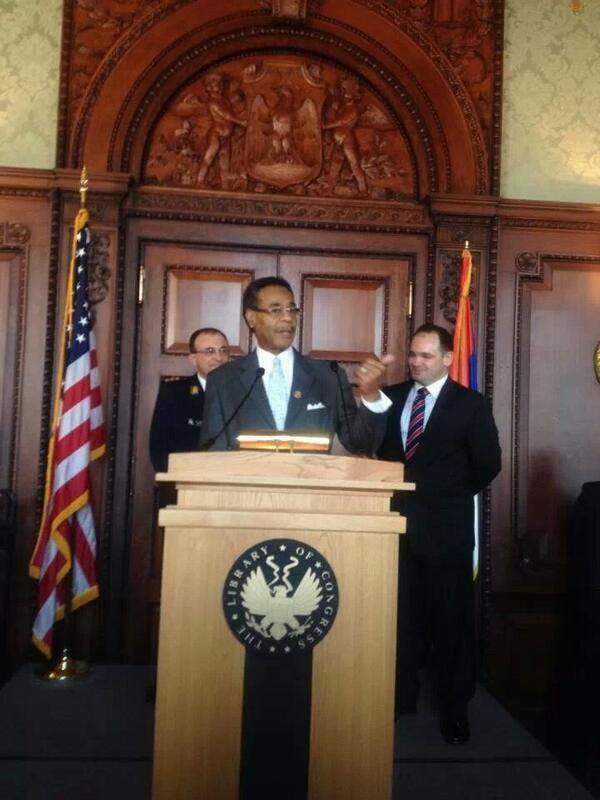 The reception took place in the Member’s Room of the Library of Congress with the support of Congressional Serbian Caucus, and its co-presidents Congressmen Ted Poe and Emanuel Cleaver. 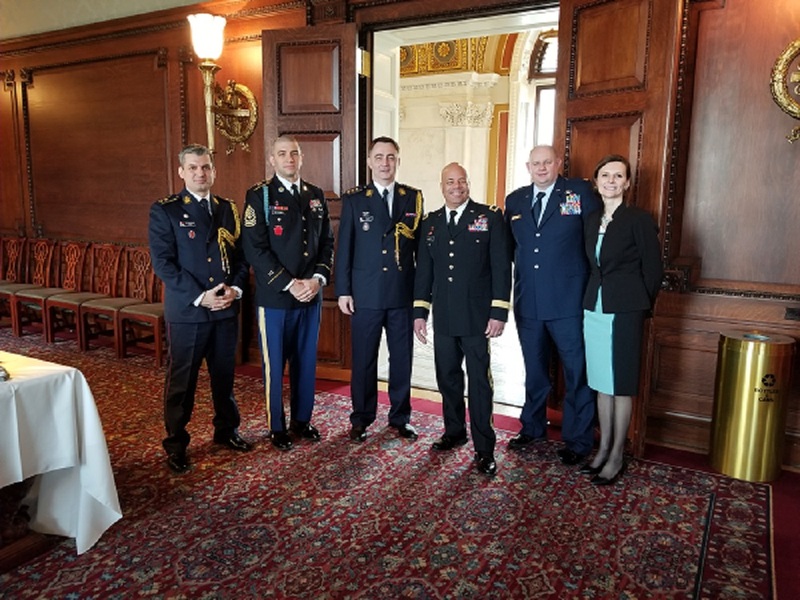 The reception was attended by nearly 250 guests, among whom were the representatives of the U.S. administration, diplomatic and military corps and the Serbian diaspora. Formal addresses were given by the Ambassador of the Republic of Serbia Djerdj Matkovic, congressman Ted Poe, Acting Deputy Assistant Secretary of State Matthew Palmer, the Assistant Adjutant General of the Ohio Army National Guard Major General John Harris, and the Deputy Secretary of State of Maryland Luis Borunda. 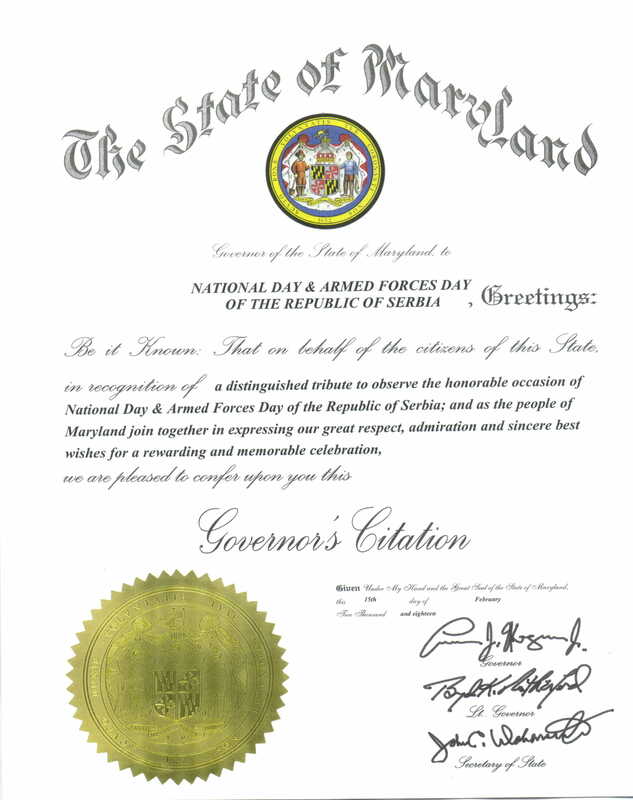 On this occasion, Mr. Borunda, while congratulating the Serbia’s Statehood Day, handed a special charter to Ambassador Matkovic on behalf of the governor and the people of Maryland, expressing “their respect, admiration and honor” to the Republic of Serbia. Washington, D.C, 8th February 2018 - "Within the preparations for the meeting with the United States Secretary of State Rex Tillerson, I had talks with the US Assistant Secretary of State for European and Eurasian Affairs Wess Mitchell. We had a thorough conversation with the aim of finding common interests shared by the United States and Serbia, to the benefit of stability, peace and future of the entire region and resolution of open issues. 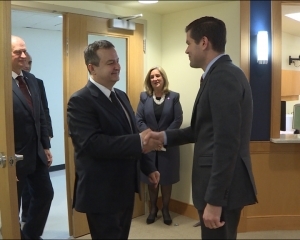 Washinton, D.C, 8th February 2018 - During his visit to Washington, D.C., First Deputy Prime Minister and Minister of Foreign Affairs of the Republic of Serbia Ivica Dacic had a separate meeting with Republican Congressman from Florida Gus Bilirakis. Minister Dacic and Congressman Bilirakis exchanged views on current bilateral topics. 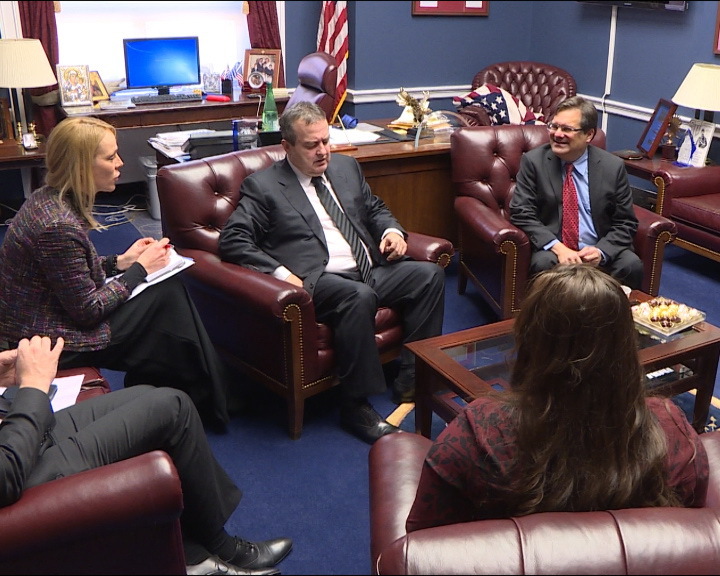 The Serbian Foreign Minister expressed his gratitude to Congressman Bilirakis for his active contribution to the activities of the Congressional Serbian Caucus in the United States Congress. on Tuesday, February 20th, 2018. Tickets can be purchased at: https://bpt.me/3327339. Washington, D.C, 26th January, 2018 – Ambassador Djerdj Matkovic was a guest at the “This is America and the World” TV show. In a 30-minute interview conducted by the famous American host and reporter Dennis Wholey, a multitude of current and topics from the rich history of Serbia were discussed. Also, Ambassador talked about the tourist and economic potential of Serbia, his goals during his service in the U.S, and the history of bilateral relations between Serbia and the U.S. The link to the interview is available here. "Jasenovac – Right to Remembrance"
The exhibition is dedicated to the International Holocaust Remembrance Day and is aimed at contributing to the maintenance of universal values of humanity and efforts to preserve the memory of the victims of Jasenovac concentration and extermination camp. 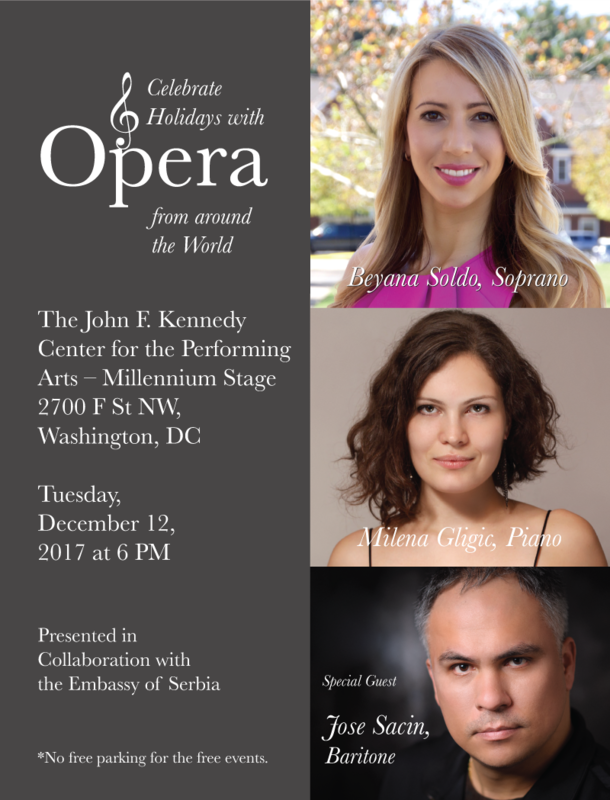 Washington, D.C, 12th December 2017 – The Embassy of the Republic of Serbia and The John F. Kennedy Center for the Performing Arts organized a concert of prominent young Serbian artists, soprano Biljana Soldo and pianist Milena Gligic on the Kennedy Center’s Millennium Stage. The guest of honor at the concert was the famous Peruvian baritone Jose Sasin. The one-hour program entitled “Celebrate the Holidays with Opera from Around the World” included solo and duet performances of famous works by Serbian, Italian, Austrian, French, Hungarian, Spanish and Mexican composers. The concert was attended by more than 200 classical music admirers from the diplomatic corps, public and academic life, as well as from the Serbian diaspora. The link to the conert is available here. Washington, D.C, 6th December 2017 – The Embassy of the Republic of Serbia in Washington, D.C. organized a formal reception for the members of the Women’s Diplomatic Series. This non-profit, invitation-only organization was founded in 2009, with an aim of enabling its members to acquire knowledge about diverse countries and cultures through dialogue, education and interaction with the Washington diplomatic community. 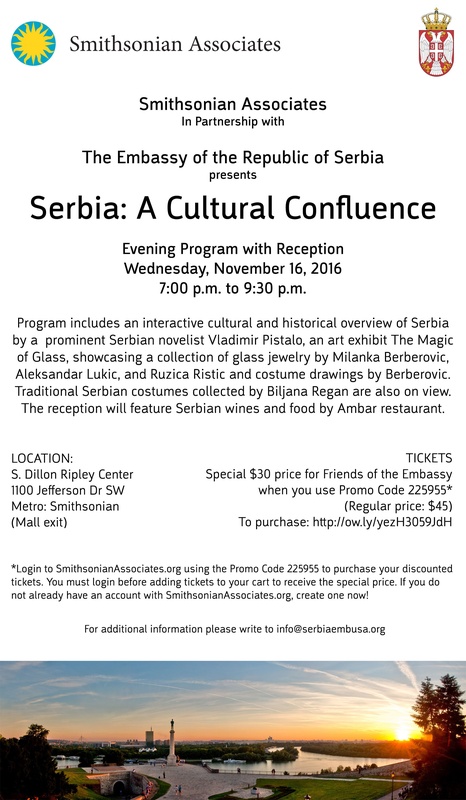 During the reception, Ambassador Djerdj Matkovic greeted the guests and presented Serbia’s cultural, turist and trade potentials, as well as a brief overview of Serbia’s history and its relations with the U.S.
Embassy of the Republic of Serbia in Washington, D.C.
on December 12th, 2017 at 6 PM. This performance is featured as part of the Kennedy Center’s free daily performance series on its Millennium Stage in the Grand Foyer: http://www.kennedy-center.org/video/performance/64265. We regret that, as the theater reaches capacity, seats cannot be saved for patrons who have not arrived or are not next in line. No free parking is provided for this event. Washington, D.C. 29 Nov 2017 - First Deputy Prime Minister and Minister of Foreign Affairs of the Republic of Serbia Ivica Dacic participated today in Washington D.C. at the Conference of the Atlantic Council on the Western Balkans. During the panel discussion entitled "Investing in the Future: Can Entrepreneurs "Fix" the Balkans?" the Serbian Foreign Minister conveyed that the stabilization of the Western Balkans was key to the development of economy in the region. "Economy can have a positive role to play in the context of stabilization of the entire region, but the two are entirely interdependent, meaning there can be no development of the economy without the stabilization of the region." "I want to say that in the Western Balkans, we are all major economic partners to each other", noted the Minister pointing to joint infrastructure projects of regional importance such as the construction of motorways and the enhancement of rail transport networks within the region. "Important steps were made by mutual agreement to remove barriers to cooperation and boost the GDP, increase investment and employment in our region." 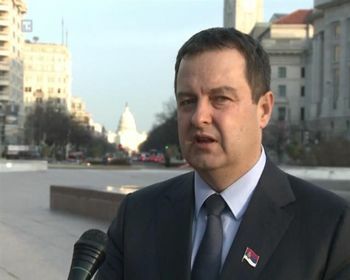 Minister Dacic underscored in particular that the Republic of Serbia had also promoted its economic relations with the United States of America. He thanked the U.S. partners for their readiness and engagement in the context of joint efforts towards the promotion of U.S.-Serbia economic cooperation. Belgrade, November 16th, 2017 – Prime Minister Ana Brnabic announced today in a video message marking the completion of the USAID Business Enabling Project (BEP) that this project fulfilled the role and provided great support to Serbia in its European integration. The US Agency for International Development and the government of Serbia marked the success of the USAID project for better business conditions - a seven-year initiative worth $ 19.5 million, which helped Serbia become a better place for business. Brnabic pointed out that this USAID project has contributed a lot to Serbia through the promotion of cooperation between the public and private sectors. Belgrade, October 31st, 2017 - First Deputy Prime Minister and Minister of Foreign Affairs of the Republic of Serbia Ivica Dacic said today, at an extraordinary press conference held at the Ministry of Foreign Affairs, that the Government of the Republic of Suriname had revoked its recognition of Kosovo and Metohija as an independent state. The Head of Serbian diplomacy conveyed that Suriname's diplomatic note on the revocation of the recognition had arrived during the night. "On 8 July 2016, they recognized the independence of Kosovo", said Minister Dacic, adding that only five states had recognized Kosovo during his term of office, while one had reversed its decision. He noted that Kosovo's independence was so far recognized by 106 states. 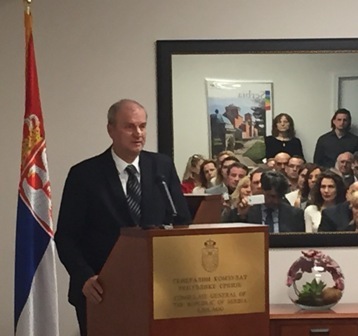 "This is a historic event for us – we haven't achieved this with money since we don't have it, nor by exerting pressure since we are not able to do so – but through our dedication instead", emphasized the First Deputy Prime Minister and Minister of Foreign Affairs of the Republic of Serbia. Belgrade, October 16th, 2017 - First Deputy Prime Minister and Minister of Foreign Affairs of the Republic of Serbia Ivica Dacic received today a trade and political delegation of the U.S. Federal State of Maryland, led by Secretary of State of Maryland John C. Wobensmith, which is visiting Belgrade. Minister Dacic highlighted Serbia's interest to intensify all types of cooperation with the United States of America, particularly in the area of economy and further attraction of U.S. investments in the Serbian economy. Interlocutors from Maryland expressed satisfaction over their visit to Serbia which would include, in addition to Belgrade, visits to Novi Sad and Nis. It was noted that the interest of this Federal State was involvement of its companies in business and investments in the area of environmental protection in Serbia. On the Serbian side, the meeting was also attended by Ministers in charge of environmental protection, and of state administration and local self-government, Messrs. Goran Trivan and Branko Ruzic, respectively. Bogota, October 10th, 2017 – Ambassador Extraordinary and Plenipotentiary of the Republic of Serbia on a non-resident basis to the Republic of Colombia Djerdj Matkovic presented his letter of credentials to the President of the Republic of Colombia Juan Manuel Santos and the Minister of Foreign Affairs of the Republic of Colombia María Ángela Holguín at an official ceremony held in the Presidential Palace Nariño on October 10th, 2017. Belgrade, October 9th, 2017 - First Deputy Prime Minister and Minister of Foreign Affairs of the Republic of Serbia Ivica Dacic met today with U.S. 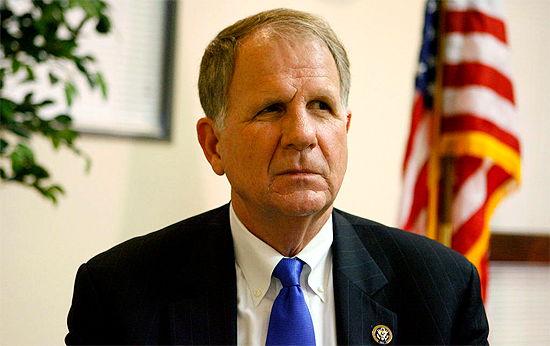 Congressman Ted Poe, Co-Chair of the Congressional Serbian Caucus, who is on a visit to Belgrade. 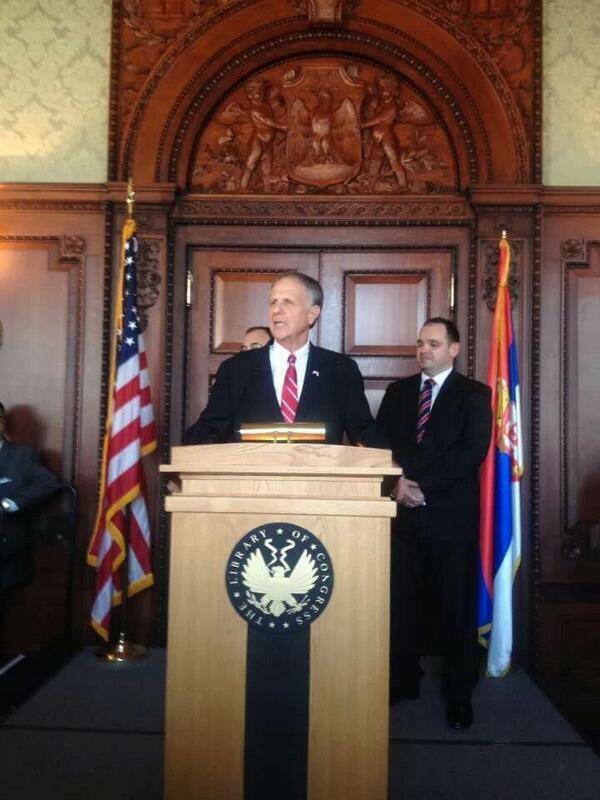 The Serbian Foreign Minister expressed his gratitude to Congressman Poe for the efforts he had made so far within the Congressional Serbian Caucus, aiming for the promotion of relations between the two countries and for a better public understanding in the United States of the policy pursued by Serbia, as demonstrated by his address in the House of Representatives on the occasion of the anniversary commemoration of the Halyard Mission, as well as by the congressional letter of support sent to Secretary of State Tillerson, on 3 October. The collocutors expressed mutual satisfaction over the promotion of overall bilateral relations, from the progress made in the political dialogue to the development of economic relations. In the talks, Serbia's aspiration towards membership of the EU was encouraged, as well as the constructive role it played in maintaining stability in the Western Balkans region. As the thanked the Minister for the warm welcome, Congressman Poe conveyed his readiness to continue his endeavours towards the further improvement of bilateral relations, recalling that the friendship between our two peoples dated back to the Allied Powers and World War I. 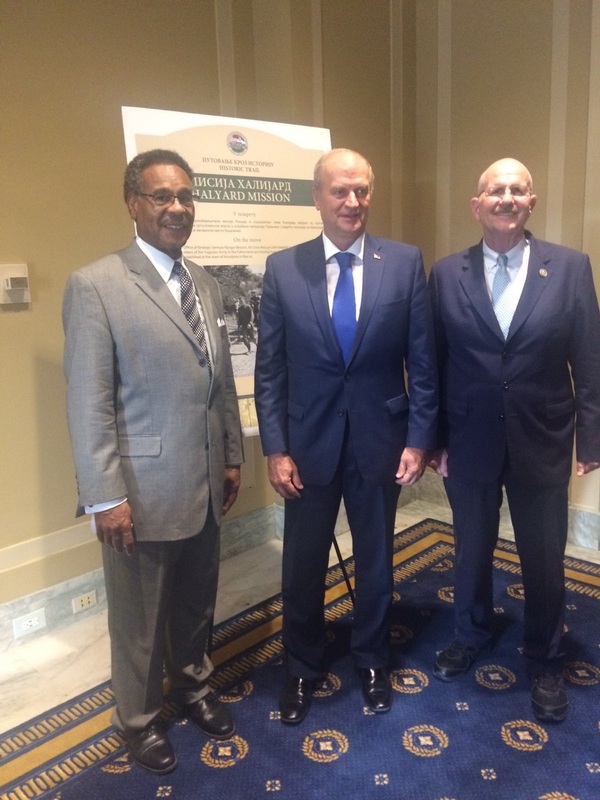 On July 18, 2017 the Embassy of Serbia in Washington, D.C. and the Co-Chairs of the Serbian Congressional Caucus, Congressman Ted Poe and Congressman Emanuel Cleaver hosted at the US House of Representatives an exhibition and evening reception in honor of the anniversary of the "Halyard" mission, the biggest aerial rescue operation in World War II that saved lives of almost 500 US pilots. The exhibition featuring the original photographs from the military operation was provided by the Halyard Foundation. 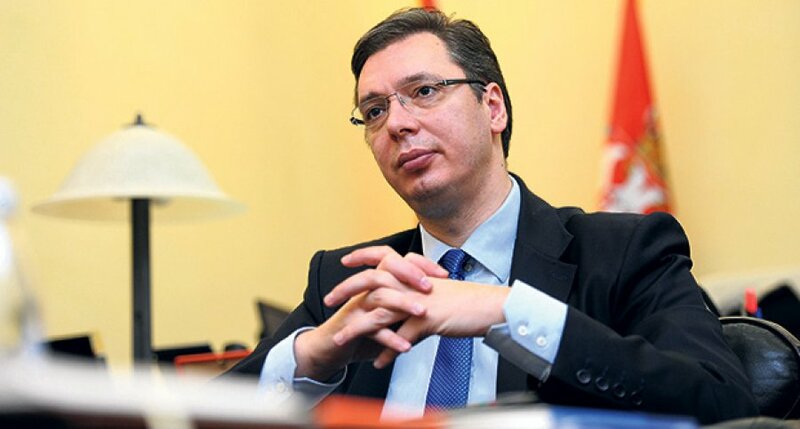 Washington, D.C. - On July 16 and 17, the President of the Republic of Serbia Mr. Aleksandar Vučić paid an official visit to the United States. 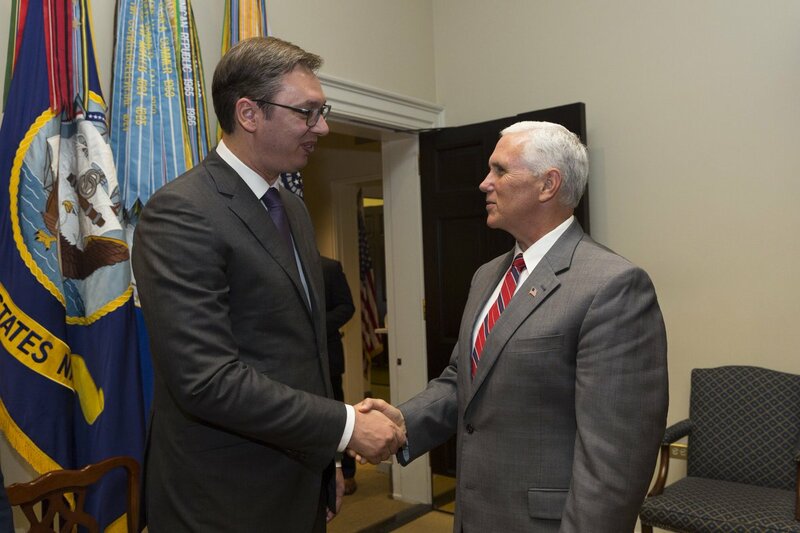 On June 17, Mr. Vucic met with the US Vice President Mike Pence, and had a number of bilateral meetings, including a meeting with the chair and co-chair of the Senate Subcommittee for Europe, Senator Ron Johnson and Senator Chris Murphy, as well as with the co-chairs of the Serbian Congressional Caucus, Congresman Ted Poe and Congresman Emanuel Cleaver. 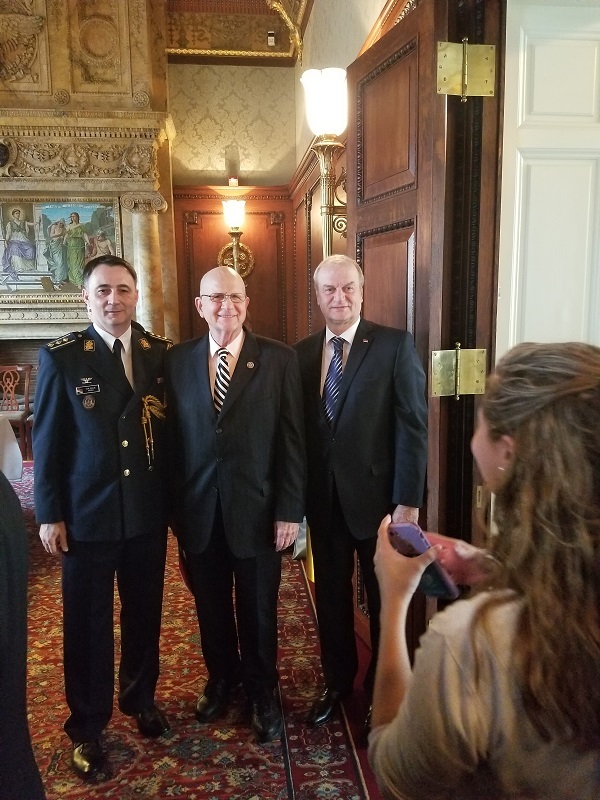 Previousely, the Serbian President met with the Chief of the Bureau of the National Guard of the United States, general Joseph Lengyel, and the Commander of the National Guard of Ohio, General Major Mark Bartman. During his visit, President Vučić also met with US companies at a business forum hosted by the Business Council for the International Understanding and attended the singning of the Memorandum with CISCO, the worldwide leader in IT and networking. 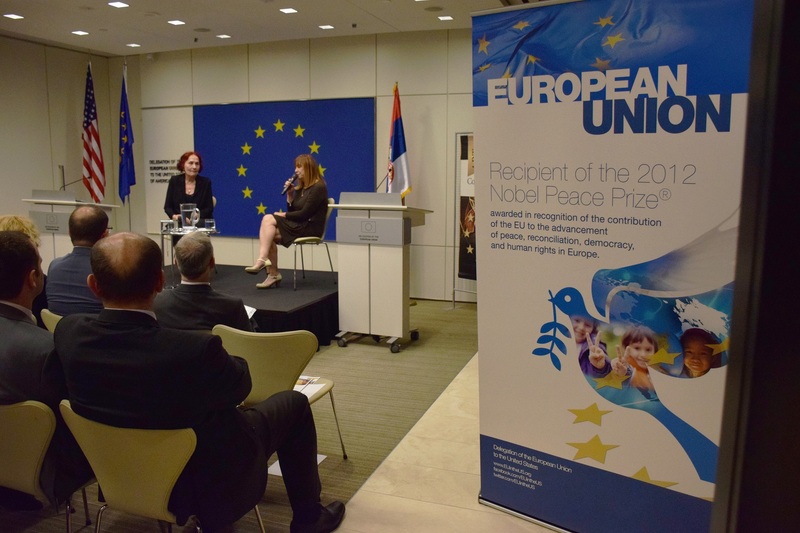 On June 7, The Embassy of Serbia had a pleasure to welcome to Washington DC Ms. Vida Ognjenovic, prominent Serbian writer, playwright, and theater director. The event was hosted by the Delegation of the European Union in partnership with the Embassy of Serbia and the Orfelin Circle. In a lively conversation with the audience Ms. Ognjenovic discussed her viewpoints on literature, science, and the impact of modern technology, marketing and the internet. The event was moderated by Mrs. Milena Trobozic Garfield. The Secretariat for Culture of the City of Belgrade has announced a public international two-phase competition for the design of a conceptual solution for the Zoran Djindjic memorial at the Students Square in Belgrade". The aim of the competition is to select the best conceptual solution for the Zoran Djindjic Memorial at the Students Square in Belgrade in memory of his life, work, social and historic changes he initiated in Serbia, as well of his tragic death on March 12, 2003. 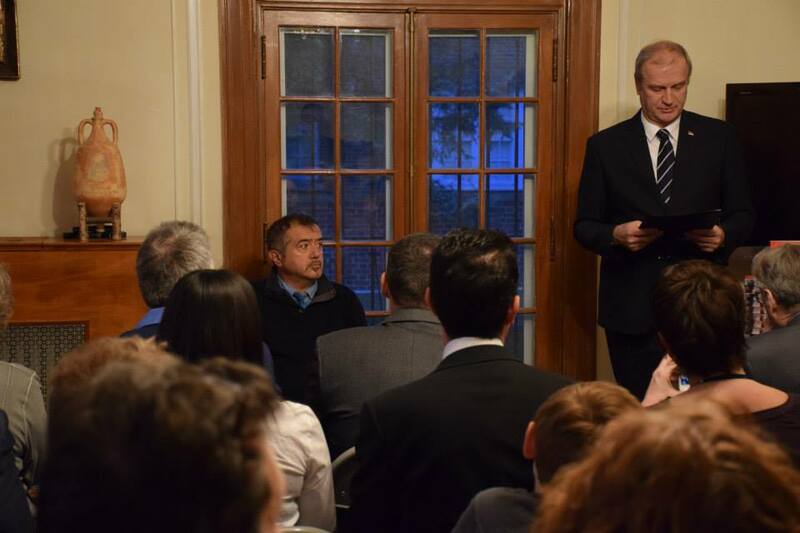 On Friday, March 10, 2017 Embassies of Serbia and France in Washington, D.C. organized a movie screening and a wine tasting event. 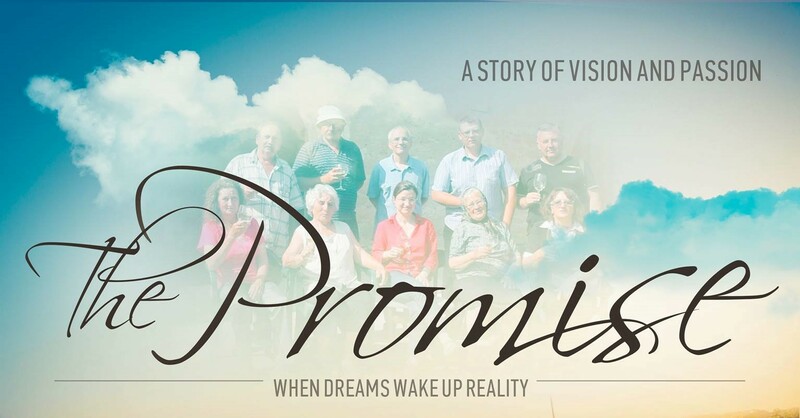 "The Promise" is a character driven feature documentary that follows an extraordinary experience of a French family who moved in a remote village of Rogljevo in Serbia to make wine. The screening was followed by Q&A with author Mr. Dusan Gajic and director Mr. Zeljko Mirkovic and a wine tasting reception. 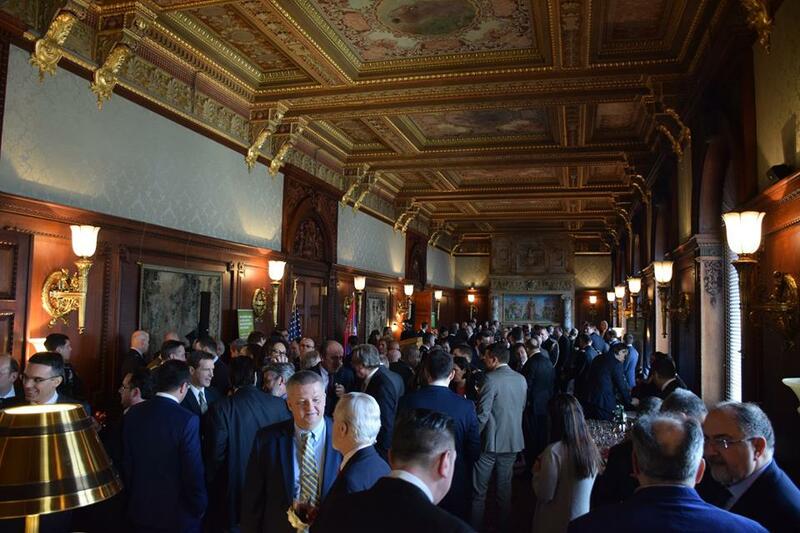 On the occasion of the National Day and Armed Forces Day of the Republic of Serbia a reception was held on February 16, 2017 at the Library of Congress, in collaboration with the Co-Chairs of the Serbian Congressional Caucus the Honorable Ted Poe and the Honorable Emanuel Cleaver II. The guest of honor was ambassador Mary B. Warlick, Principal Deputy Assistant Secretary of State and Special Envoy for International Energy Affairs at the State Department. Washington, DC, Thursday 2, 2017 - First Deputy Prime Minister and Minister of Foreign Affairs of the Republic of Serbia Ivica Dacic is in Washington today, attending the 65th National Prayer Breakfast. 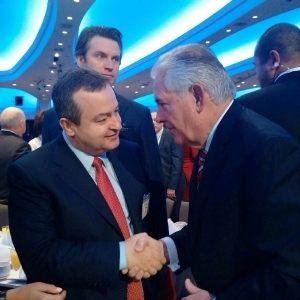 During the Prayer Breakfast, the Serbian Foreign Minister talked with the new United States Secretary of State, Rex Tillerson. Minister Dacic invited the US Secretary of State to visit Serbia. The Ministry of Culture and Media of the Republic of Serbia, Department of Contemporary Artistic Production and Creative Industries, announced the OPEN CALL for the Co-Financing of Projects for the Translation of Representative Works of Serbian Literature into Foreign Languages in 2017. The scope of the Open Call is co-financing of projects for the translation of representative works of Serbian literature into foreign languages. The overarching goal is the translation of representative works of Serbian literature into foreign languages. Submissions in the following literary fields are eligible under the Open Call for the translation of representative works of Serbian literature into foreign languages: poetry, prose, drama, children’s literature (other than picture books and textbooks), anthologies and thematic selections and theoretical works in the fields of culture and arts intended for the wider readership. The Open Call is valid through February 28, 2017. On the occasion of the International Holocaust Remembrance Day and the 75th anniversary of the founding of Jasenovac concentration camp, a delegation of Serbia headed by Mr. Vladimir Bozovic, Advisor to the Serbian Prime Minister visited the United States. The Delegation composed of government officials, survivors and researchers took part the main commemoration at the United Nations Headquarters in New York City and attended an art exhibition "The Truth about Jasenovac – the Right to Remembrance", the biggest exhibition on Jasenovac ever displayed in a foreign country. The presentation included a presentation of the book by Djuro Zatezalo "Baron Mihajlo Mikasinovic", a general of Serbian origin in the Austrian Army. The book provides an insight into the context of the mid-eighteen century lives of Serbs on the Military Frontier of Austro-Hungary and the many aspects of their struggle. 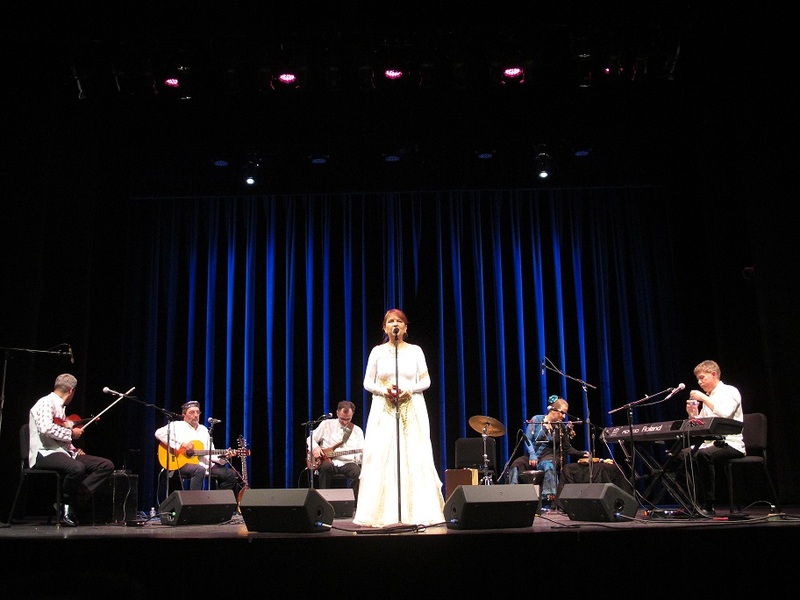 Washington, D.C. - On December 13, 2017, a prominent Serbian ethno singer Bilja Krstic and the Bistrik Orchestra performed at the Kennedy Center Millennium stage. The concert was organized by the Kennedy Center and the Embassy of Serbia in Washington, D.C.
Bilja Krstic and the Bistrik Orchestra create music that is a fusion of traditional ethno music, a cappella songs and ethno grooves with original improvisation and a modern music approach. This year the ensemble is celebrating its 15th Anniversary. In January 2017 British world and folk music record label Arc Music will produce the group's new album, entitled SVOD. 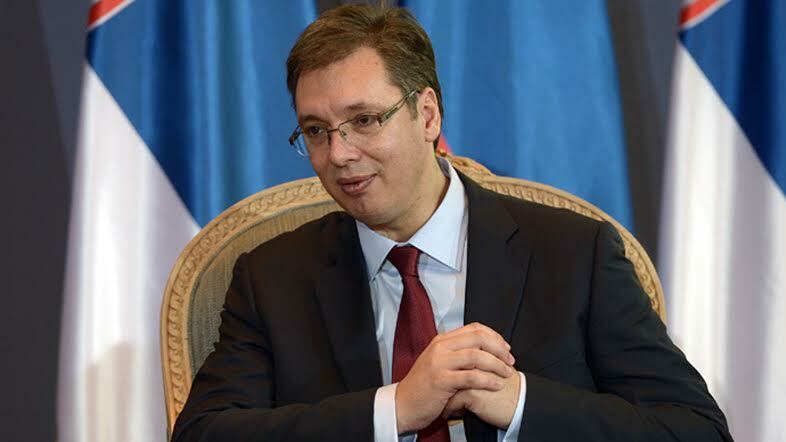 Belgrade, 9 Nov 2016 – Serbian Prime Minister Aleksandar Vucic has congratulated Donald Trump on the victory in the elections for the President of the United States. "I take this opportunity to express my sincere congratulations on your election success and a great victory in the presidential election. I believe you will approach your duties of the 45th President of the United States with dedication and determination that characterised your remarkable campaign. The leadership that you showed on this occasion is a strong will that is necessary not only to citizens of the United States, but also throughout the world. I sincerely hope that your victory will contribute to continuing improvement of bilateral relations between Serbia and the United States, which are already on the path of progress and development for the mutual benefit of our two countries," reads the congratulatory message of Prime Minister Vucic. Belgrade/New York, 23 Sept 2016 – Prime Minister Aleksandar Vucic met today in New York with US Deputy Secretary of State Antony Blinken, with whom he discussed relations between the two countries, the situation in the region, Serbia's European path and dialogue with Pristina. Prime Minister Vucic informed Deputy Secretary of State Blinken about the economic reforms that the Serbian government has implemented, and underlined that Serbia has invested a lot in its progress and will do everything to maintain stability in the Western Balkans, because a stable region means economic prosperity of all countries. Expressing gratitude to Deputy Secretary of State Blinken for the commitment and support provided to Serbia, Vucic expressed his gratitude for the extraordinary visit of Vice President Joseph Biden to Belgrade and his personal support Serbia. US Deputy Secretary of State Blinken said that for the United States the relationship with Serbia, as a key country of the region, is very important, and welcomed all the reforms that the Serbian government has conducted. He stressed that it is important for Serbia to continue on its European path, as this will speed up the progress of the entire region. Blinken conveyed to Prime Minister Vucic the greetings of US Vice President Joseph Biden and his message that he is very satisfied with his visit to Serbia in August this year. Belgrade, 16 Aug 2016 – Prime Minister Aleksandar Vucic said today after a meeting with US Vice President Joseph Biden that a significant US support is expected in maintaining peace and stability in the region, without which there is no better life for citizens, nor economic progress. The Prime Minister expressed his gratitude to the United States for endorsing Serbia's European path, adding that our country is making every effort to fulfill all of its obligations as. We also discussed bilateral relations between the United States and Serbia, the Belgrade-Pristina dialogue and possible progress in the future, as well as regional relations and Serbia's European path, Vucic said. "Congresswoman Bentley will be remembered for her invaluable contribution to the improvement of the state of affairs in the country she lived in, and for the fact that she had never forgotten her Serbian roots, as proven by actively promoting interests of the Republic of Serbia and its people. We will always remember both the support she lent to our country in the most precarious of times in its history and her contribution to the advancement of the overall relations between the Republic of Serbia and the United States of America. As an American of Serbian descent, Congresswoman Bentley has continuously participated in the life of the large Serbian community in the United States, and has regularly organized, participated and made her selfless contribution to humanitarian efforts and other activities carried out by the Serbian expatriate community. With her passing, the Republic of Serbia has lost a true friend." In accordance with the decision of the Government of the Republic of Serbia, August 5 is observed as a Day of Remembrance, in memory of the suffering and persecution of 250.000 Serbs by the Croatian army during "Operation Storm" in 1995. We invite all interested members of the Serbian Diaspora to attend the national commemoration on August 4, 2016 at 8 p.m. at the temple of St. Cyril and Methodius, Busije, Zemun. The ceremony will be broadcast live on the Radio Television of Serbia. On June 23, 2016, after a break of nearly a quarter of a century, a new direct flight from Belgrade to New York City has been re-established. The AirSerbia flights to New York will be operated five times a week under the numbers YU500 and YU501, the same ones which Air Serbia’s predecessor JAT Yugoslav Airlines used when it had direct flights to NYC. The Airbus A330 aircraft named after Nikola Tesla, the most famous Serbian-American, has capacity of 254 seats, economy and business class. The first wide-body aircraft for intercontinental regular traffic between the Balkans and the United States is currently the largest aircraft in the fleet of Air Serbia.The Serbian airline is now the only company in the region that has a direct flight to the United States. On June 19, 2016 H.E. Djerdj Matkovic, Ambassador of Serbia, participated in the bust dedication ceremony honoring Mileva Maric at the Serbian Cultural Garden in Cleveland, Ohio. While Mileva Maric, the wife of Albert Einstein, a brilliant mind and physicist and mathematician herself is the first woman honored in this park, the Serbian Garden already features the busts of Bishop Petar Petrovic Njegos, Mihajlo Pupin, King Petar I, Nikola Tesla, Stevan Mokranjac and Vuk Karadzic. H.E. Mr. Djerdj Matkovic, Ambassador of Serbia, attended the 46the session of the General Assembly of the Organization of American States in Santo Domingo, June 13-15. The main theme of the General Assembly this year was „Institutional strengthening for sustainable development in the Americas“. 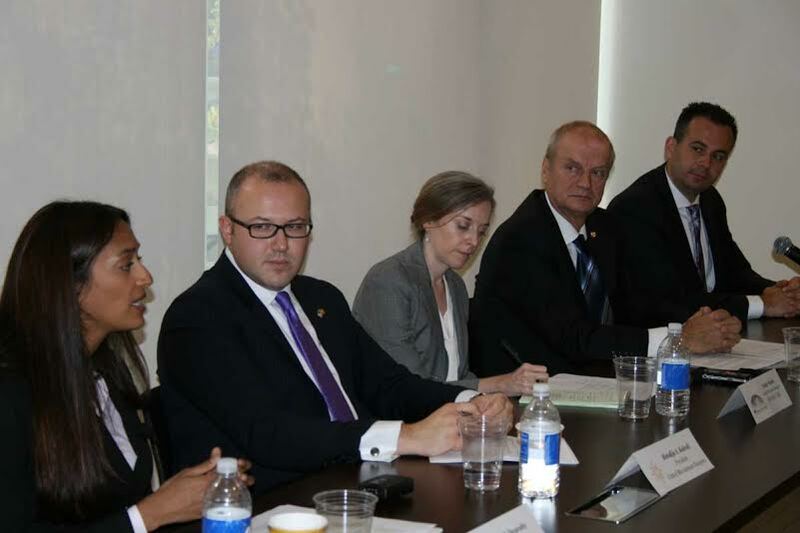 During this three day conference Ambassador Matkovic met with a number of heads of delegation of the OAS member states. In those meetings ambassador Matkovic presented a candidature of Serbia for the position of United Nations Secretary General and confirmed Serbia's interest in continuation of a fruitful political dialogue with countries of Latin America and the Caribbean. 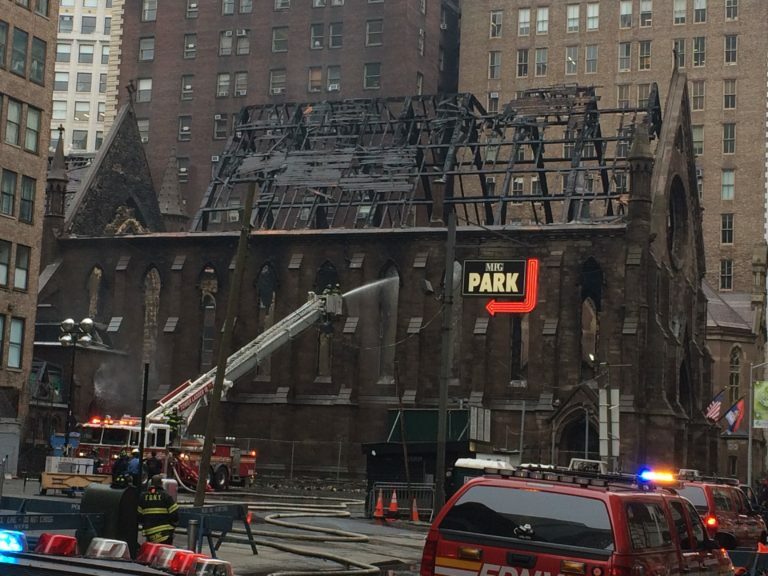 "We are shocked by the news of the fire that destroyed the historic Serbian Orthodox Cathedral of St. Sava in New York City, last night on Orthodox Easter. I wish to express my heartfelt sorrow for this tragedy and send my sympathies to father Djokan Majstorovic, the Serbian Orthodox Diocese of Eastern America and the Serbian Orthodox Church as well as to the Serbian community in New York. 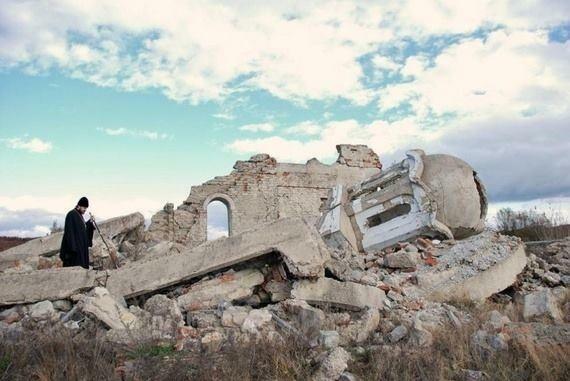 At this difficult moment we should stand united and ready to assist and support reconstruction efforts and help rebuild the Serbian Orthodox Cathedral, our spiritual and cultural center in New York City, for ourselves and for our children." 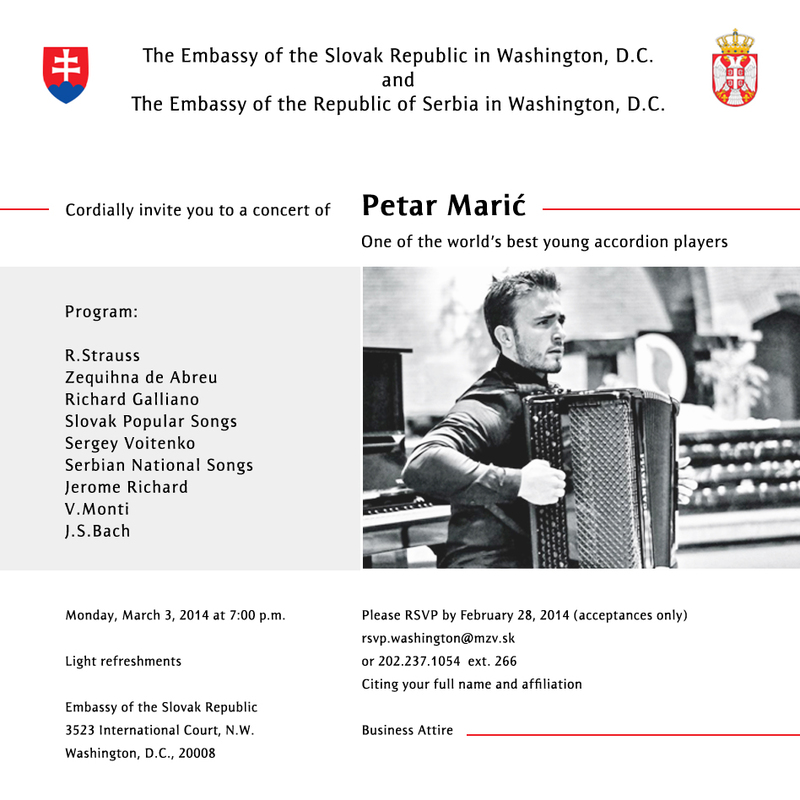 March 10, Washington - Ambassador of Serbia H.E. 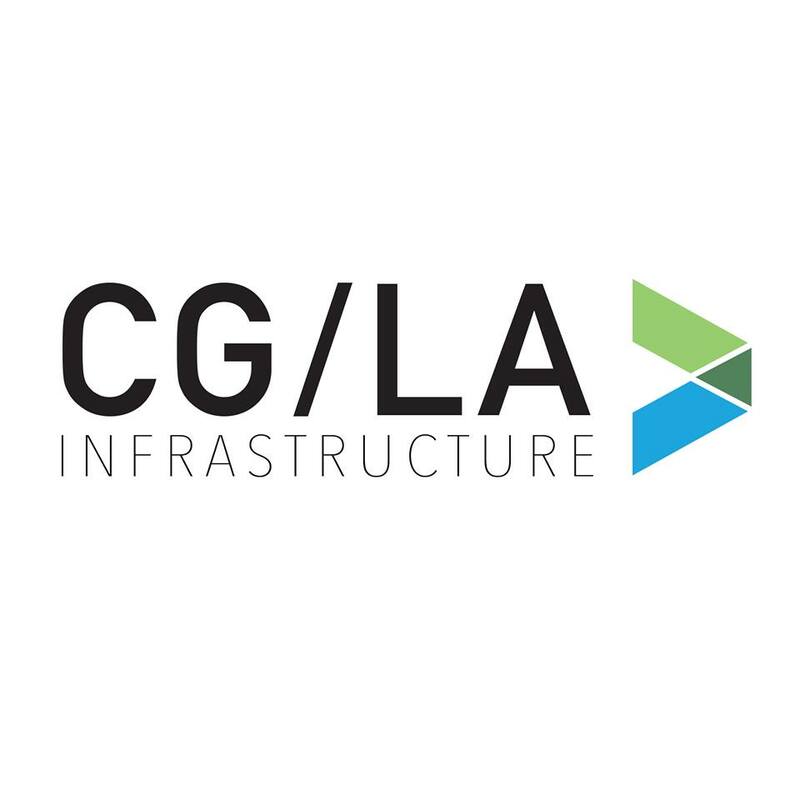 Mr. Djerdj Matkovic participated in the 9th Global Infrastructure Leadership Forum, that is taking place in Washington DC, March 9th - 11th. The forum is designed to provide a unique marketplace by bringing high level executives from engineering, construction and technology sectors together with key decision-makers from the public sector, multilateral development banks and project sponsors from around the world. Ambassador Matkovic presented "Nikola Tesla Airport" privatization potentional and met with companies interested in doing business in Serbia. The Embassy of Serbia in Washington DC and the Alliance Française de Washington are proud to present a screening of "We will be world Champions" (Bicemo prvaci sveta) on March 2 at 7 pm. 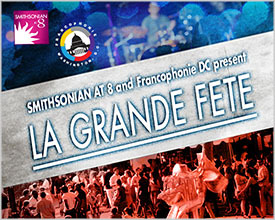 This event is part of the DC Francophonie Festival. 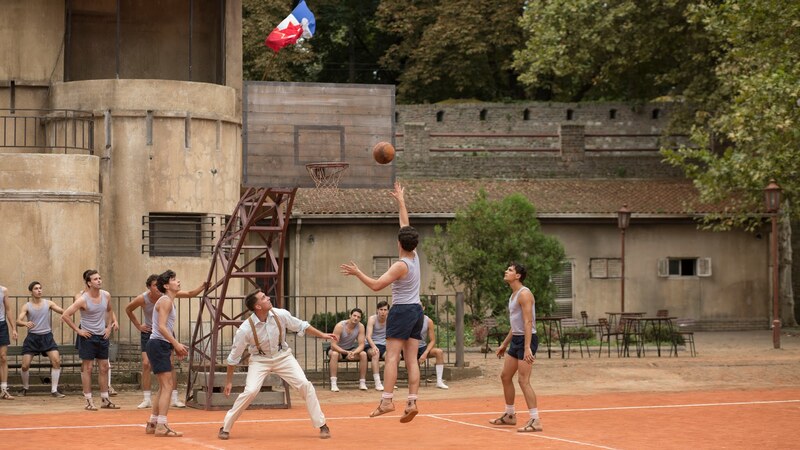 "We Will Be the World Champions" is a story about four pioneers who fathered the Yugoslav school of basketball, and whose merit is the development of this sport in Europe. The central event is the crucial game at World Cup 1970 between Yugoslavia and the United States. From the point of view of the main character, Nebojša Popović, we follow the growth and life path of enthusiasts, whose professional work, ideas and efforts made their major dream come true, the first gold medal for Yugoslavia in world championships. 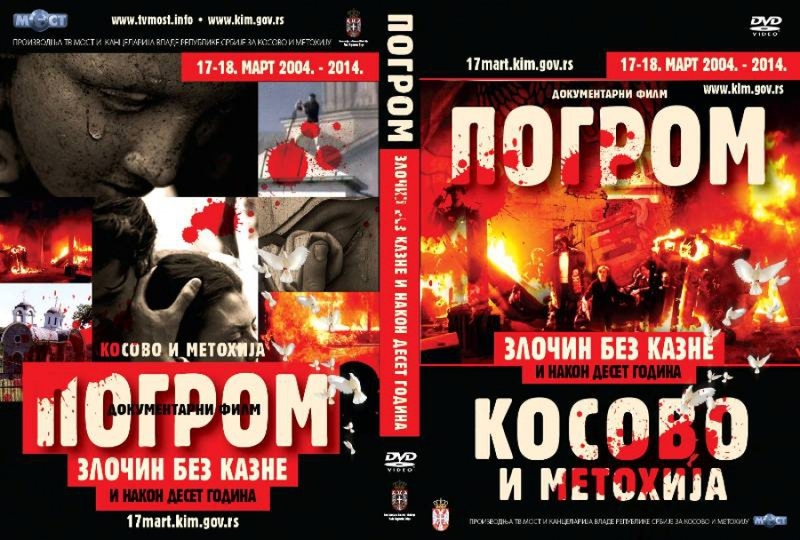 The movie will be in Serbian will English subtitles. The Embassy of Serbia in Washington DC is pleased to be part of this year's the DC Francophonie Festival, that will take place from 1 to 18 March on various locations in DC. D.C. Francophonie Cultural Festival celebrates the diversity and richness of the French language and francophone communities around the world through a series of cultural events and outreach programs presented every spring in the U.S. capital region. Celebrating the creative artistry of the French-speaking world, the Francophonie Cultural Festival is a voyage of exploration, discovery, and cultural sharing that highlights the diversity of the French language and cultures. Since 2001, more than 40 embassies and partners (including AFDC and The Smithsonian Associates) have collaborated each year to present an array of experiences all rooted in the Francophone culture — from Africa to the Americas to Asia to the Middle East–through concerts, cuisine, films, literary salons and lectures for all ages. As an observer in the International Organization of the Francophonie Serbia is pleased to contribute to the program of the Festival in Washington DC. Serbian Ambassador in Washington Đ. Matkovic headed the delegation of the Republic of Serbia at the 21st regular Ministerial Council of the Association of Caribbean States (ACS) held in Petion-Ville, Haiti, January, 18 – 19, 2016. In addition to a number of meetings with the countries of the Caribbean region, Ambassador Matkovic met with S. Honore, UN SRSG and Head of the UN stabilization mission in Haiti – MINUSTAH, in which Serbia is a participating state. 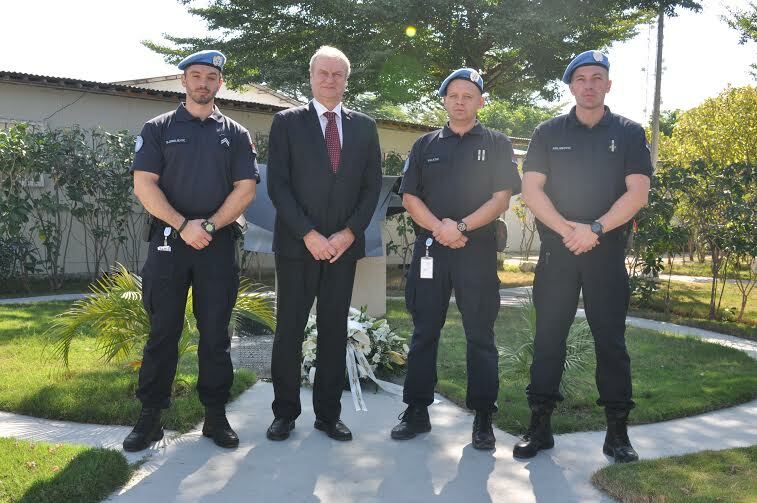 On that occasion, the Ambassador visited the personnel of the Ministry of Interior of the Republic of Serbia who are part of MINUSTAH since July 2015. Since 2008 Serbia’s contingent has been providing training and monitoring support to the National Guard of Haiti. 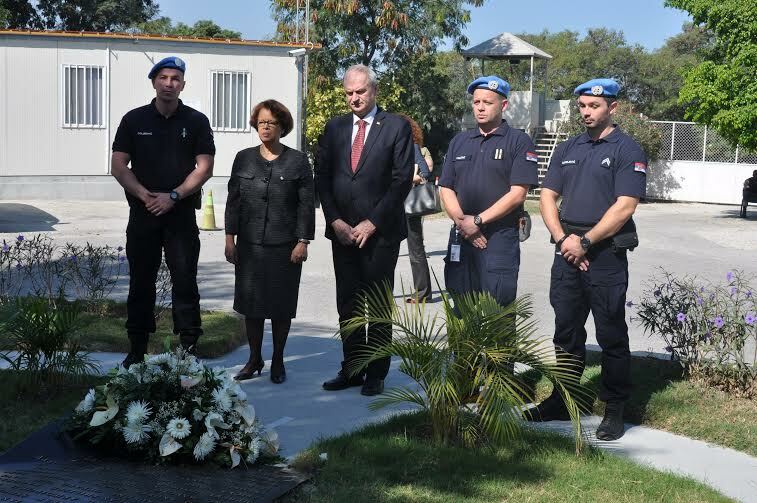 Together with the Head of MINUSTAH and Members of the Serbian Delegation Ambassador Matkovic laid a wreath at the memorial dedicated to victims of the earthquake of January 12th, 2010, commemorating six years since the tragic event in which 220,000 civilians and around 100 members of MINUSTAH lost their lives. On October 13, Ambassador of Serbia H.E. Djerdj Matkovic participated in a panel discussion „Responding to the Refugee Crisis in Southeast Europe”. The event explored the short- and long-term effects of the crisis on the legal systems and security within countries on the Western Balkan Route. 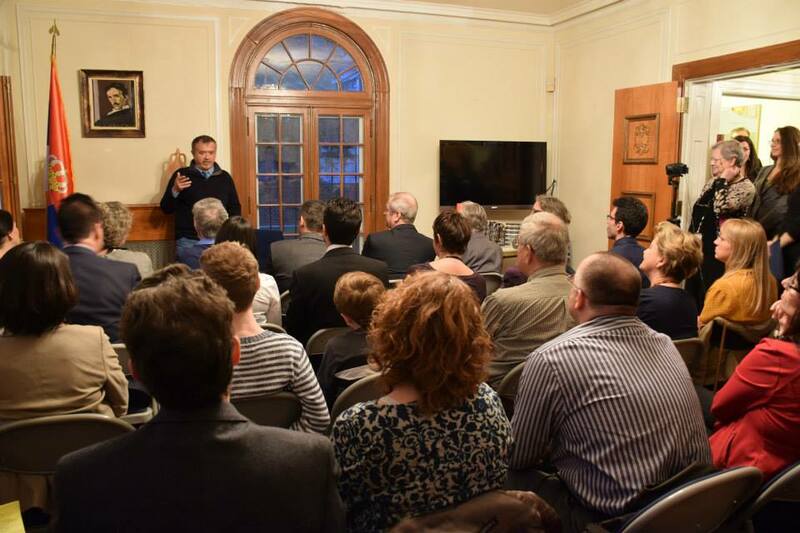 The event was organized by American Bar Association ABA ROLI and the United Macedonian Diaspora. Speakers included Ambassador of the Republic of Macedonia V. Naumovski, President of the United Macedonian Diaspora M. Koloski, and N Dasarathy, Senior Advisor from ABA ROLI’s Middle East and North Africa division. Tuesday, October 20, 2015, at 2 p.m.
• Because the request for its membership is a serious breach of the international law, the Constitution of UNESCO' The legally binding UN Security Council resolution 1244 (1999) and the Charter of the UN whose Article 25 says that "The Members of the UN agree to accept and carry out the decisions of the Security Council in accordance with the present Charter". • Because according to the UN Security Council resolution 1244, which reaffirms the sovereignty and territorial integrity of the Federal Republic of Yugoslavia (now Serbia), Kosovo and Metohija is an integral part of the Republic of Serbia, under the administration oBf the UN. Since Kosovo cannot be considered a State, it does not fulfill the basic requirement for membership set out by the UNESCO Constitution. • Because this is an unacceptable politicization of UNESCO which should not overtake the competences of the UN. Security Council as the highest authority for the preservation of the international peace and security. UNESCO should not serve as an instrument for the affirmation of an illegal and unilaterally declared independence of a part of the territory of one UN member state. The primary goal of UNESCO is to promote universal values of humanity through education, science and culture not to make political decisions with regard to the statehood. On September 16, the Center on the United States and Europe (CUSE) at Brookings will host Serbian Prime Minister Aleksandar Vučić for a public address on Serbia’s outlook, and how the country can enhance political and economic stability and cooperation in the region and reaffirm its European perspective. In his remarks, the Prime Minister will explore challenges and opportunities for the country and the continent as a whole, including the rapidly-growing influx of migrants and refugees and the importance of regional reconciliation. Washington, 4 June 2015 – Prime Minister Aleksandar Vucic spoke today in Washington with US Deputy Secretary of State Antony Blinken about support to Serbia's European path, the situation in the region, dialogue with Pristina and the Serbian foreign policy activities. Vucic highlighted the necessity of political support of the United States to the US European integration of Serbia, and added that a lot has been done to preserve peace and stability in the region. He informed Blinken about economic reforms undertaken by our country and invited him to visit Serbia. The US Deputy Secretary of State expressed his satisfaction with personal commitment and the role of Prime Minister Vucic in the region and the work of the Serbian government. Blinken stressed that everything that has been done so far has led to closer cooperation of Serbia and the United States, and of Serbia and the EU, and confirmed that the United States will encourage the EU to open negotiations on chapters with Serbia. He welcomed the economic reforms and pointed to the need of a greater presence of American investors in Serbia. 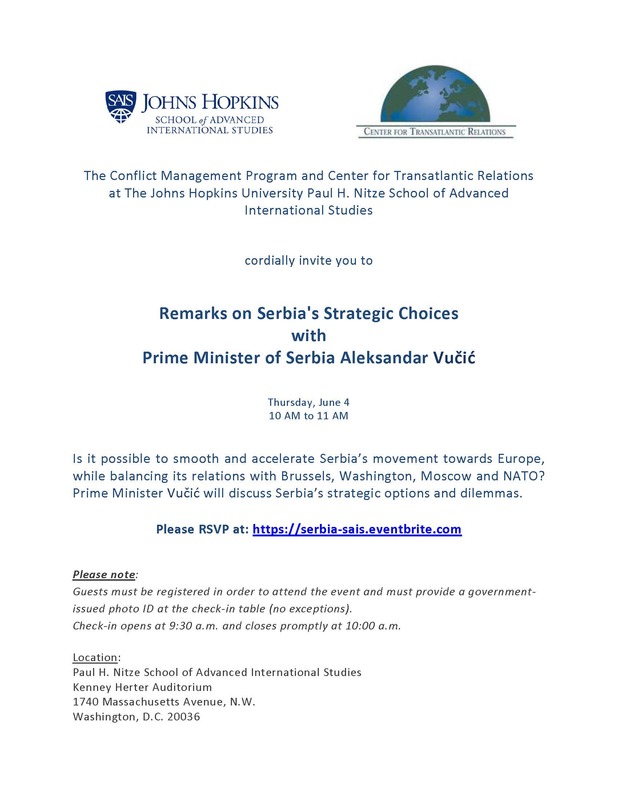 Washington, 4 June 2015 – Prime Minister Aleksandar Vucic delivered remarks at the Johns Hopkins University in Washington on the topic of European integration of Serbia. Addressing the audience, PM Vucic stated that Serbia has three main objectives, and these are internal and regional stability, the creation of a strong economy and an open, democratic society. The Prime Minister stressed that Serbia is a pillar of stability in the region and outlined the details of foreign policy activities in the past year, starting from the visit of the Albanian Prime Minister to Serbia after almost 70 years, through his visits to Sarajevo and Zagreb and his first historical visit to Albania last week. He underlined that Serbia has good relations with all countries in the region and reiterated the importance of dialogue with Pristina, which has greatly contributed to the stability of the entire region. The Serbian Prime Minister also mentioned the economic measures, fiscal consolidation measures, new laws and legal reforms as serious conditions to ensure political and economic stability of Serbia. "The Balkans remain a sensitive region, but I hope that we will manage to preserve stability. Forecasts for Serbia are not bad, but the biggest challenge for us is to preserve the political stability of the region. To do this, we expect political support of the European Union", Vucic concluded. Washington, 3 June 2015 – Prime Minister Aleksandar Vucic spoke in the White House with Assistant to the President for National Security Affairs Susan Rice and said after the meeting that Serbia can count on US support. Vucic said that Rice expressed unequivocal support for the opening of the first chapters in Serbia’s negotiations with the EU, and added that he believes that the signal from Washington to the EU will be a signal of support for Serbia. When you have the support of the United States, then everything is much easier, and that is important for Serbia, Vucic said. He said that the meeting with Rice was good, useful and responsible and that she expressed a very high opinion on the economic and political reforms undertaken by Serbia, as well as on the preservation of political stability in Serbia and in the region. Serbia can count on the support of the United States, the Prime Minister stressed. The Prime Minister announced that tomorrow he will talk with US Assistant Secretary of State for European and Eurasian Affairs Victoria Nuland, and that he should also meet with European Commissioner for Enlargement and Neighbourhood Policy Johannes Hahn, who is currently in Washington. Vucic will have political talks with US officials and he will also visit the John Hopkins University where he is due to deliver a speech. Washington, 3 June 2015 – Prime Minister Alekandar Vucic stated that all the talks he had with representatives of large American companiesduring his visit to the United States were very good and that in all of them, the importance of preserving political and economic stability for Serbia was highlighted. Vucic told the Tanjug news agency late yesterday from Washington that during the talks he pointed out that political and economic stability are crucial for the reduction of state deficit. Our country is getting more and more respect in the world and I am proud of that fact, and when you are treated like that in the United States then I think Serbia can count on a much better future, the Prime Minister stated. Yesterday he spoke with representatives of Microsoft, General Electric, Freeport-McMoRan, NCR and other companies and in all the talks the both sides expressed great interest in cooperation. Belgrade/Washington, 2 June 2015 – Prime Minister Aleksandar Vucic began his three-day visit to Washington by meetings with representatives of the biggest US companies interested in investing in Serbia, and with representatives of companies that already operate in the territory of Serbia and intend to increase their capacity. Washington, 2 June 2015 – Prime Minister Aleksandar Vucic has arrived on an official visit to the United States of America where, at the invitation of Vice President Joe Biden, he will stay until 4 June. Vucic told the Radio-Television Serbia (RTS) upon arrival in Washington that this visit is very important for our country, and expressed his satisfaction that he will meet with senior US officials and representatives of a large number of US companies. American investors will not consider investments in one country if there is no political stability and if the US government does not approve it, he said. The Prime Minister underlined the importance of the talks that he will have on the first day of his official visit with representatives of the three companies related to IT sector, General Electric, Microsoft and NCR. After that, he will meet with US Deputy Secretary of State Antony Blinken, and later, with representatives of the Serbian diaspora in the United States. Ten day soccer camp “Sport camps for children and Diaspora" for children from the Diaspora aged 8 to 14 years, starts on July 15 at the Zlatar Mountin. The camp is organized by the Ministry of Youth and Sports in cooperation with Office for Diaspora and Serbs in the region and the Sports Association of Serbia. In addition to soccer training, participants will attend educational sessions, lectures on national history and the Serbian language classes. The total price of 350 euros includes daily sports training, ten days of room and board, all meals, transport by bus from Belgrade - Zlatar – Belgrade and a medical examination. Parents need to provide a written consent for the participation of the child and a valid health card. Chicago, May 16, 2015 - H.E. Mr. Đerđ Matkovic, Ambassador of Serbia, visited Chicago on 14 and 15 May 2015. During his stay Amb. Matkovic had meetings with Deputy Governor of the State of Illinois Ms. Evelyn Sanguinetti and Deputy Mayor Mr. Steve Koch on further cooperation between Serbia and Illinois, as well as between Sister Cities Belgrade and Chicago. He also met with the representatives of the Academy of "Sveti Sava", paid a visit to the Serbian Parochial school in Chicago, the Holy Resurrection Orthodox Cathedral and Serbian-American Museum St. Sava. 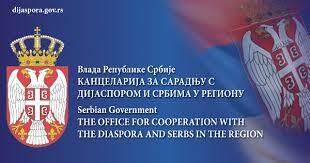 The visit was specially focused on strengthening economic ties with the Serbian Diaspora. The Serbian-American Chamber of Commerce and the Consulate General of Serbia in Chicago organized a meeting between the ambassador, business people and representatives of the Diaspora titled "The importance of the Diaspora in the economic cooperation with Serbia - Possibilities and Challenges". Ambassador Matkovic conveyed readiness of the Embassy and the Consulates General of Serbia in the US to assist all members of the Diaspora interested in investing in Serbia or doing business with Serbian companies. Belgrade, 12 May 2015 – Deputy Prime Minister and Minister of Construction, Transport and Infrastructure Zorana Mihajlovic and US Ambassador to Serbia Michael Kirby today signed the Agreement on Air Transport between the governments of Serbia and the United States. Mihajlovic said after the signing of the agreement that all technical requirements for direct flights between Serbia and the United States have been met, and expressed hope that they will start as soon as possible. She said that the US Federal Aviation Administration ranked Serbia in the category of the first order, which in aviation means that the country is safe and that it can apply for direct flights. The establishment of direct flights after 23 years will have great significance for the further economic development of Serbia, Mihajlovic assessed and reiterated that our country is ready as far as technical conditions are concerned. The next step are talks between air authorities which will decide when to establish direct flights. Kirby expressed the hope that this will be done in the near future, probably in a few months, noting that it largely depends on the companies that are to operate flights. Belgrade, May 8, 2015 - First Deputy Prime Minister and Minister of Foreign Affairs of the Republic of Serbia Ivica Dacic met today with US Congressional Representative Dana Rohrabacher, Chairman of the House Europe, Eurasia Subcommittee, who is visiting the Republic of Serbia in the framework of his tour of the region. During the meeting, the interlocutors exchanged views on regional topics, including on current bilateral and international issues. Minister Dacic expressed his satisfaction over the positive dynamic of the bilateral dialogue and indicated that Serbia’s foreign policy position today was much better, inter alia as a result of recognition of its commitment to the dialogue with Pristina and the constructive relations with neighbouring countries. 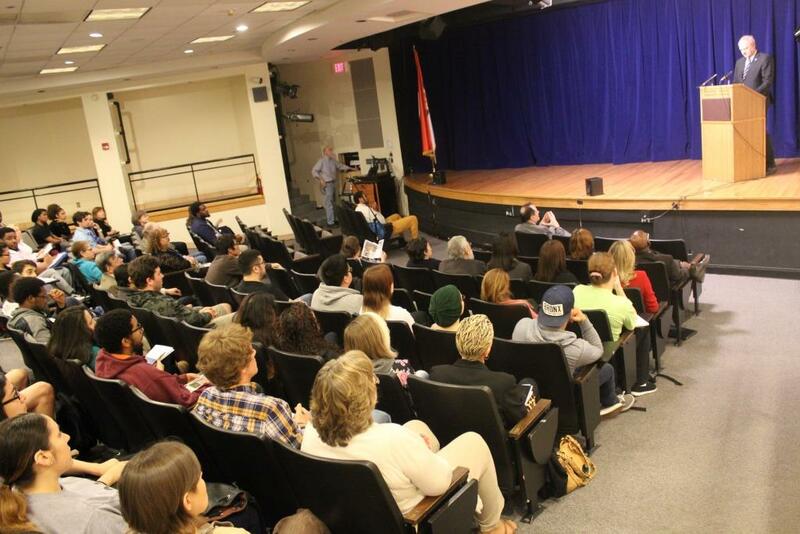 Ambassador Djerdj Matković delivered remarks at the North Virginia Community College (NOVA) on April 23, 2015, as a part of NOVA’s multicultural week. Ambassador Matković presented fоreign policy priorities, economic potentials, tourist destinations and cultural heritage of Serbia. Belgrade, 14 April 2015 – Minister of Education, Science and Technological Development Srdjan Verbic and US Ambassador to Serbia Michael Kirby today signed a Memorandum of understanding on the Fulbright academic exchange programme, which provides for an increase in the number of scholars and intensive cooperation of educational, scientific and research institutions of Serbia and the United States. Verbic said that the Fulbright grants are intended for students, professors and researchers, and that there have been 150 Fulbright programme participants from Serbia in the last 15 years. The Minister of Education also noted that this programme exists in more than 150 countries. Kirby said that the Fulbright academic exchange programme is one of the most prestigious American exchange programmes and that it is good that the Ministry of Education wants to help young people get their education in the United States. 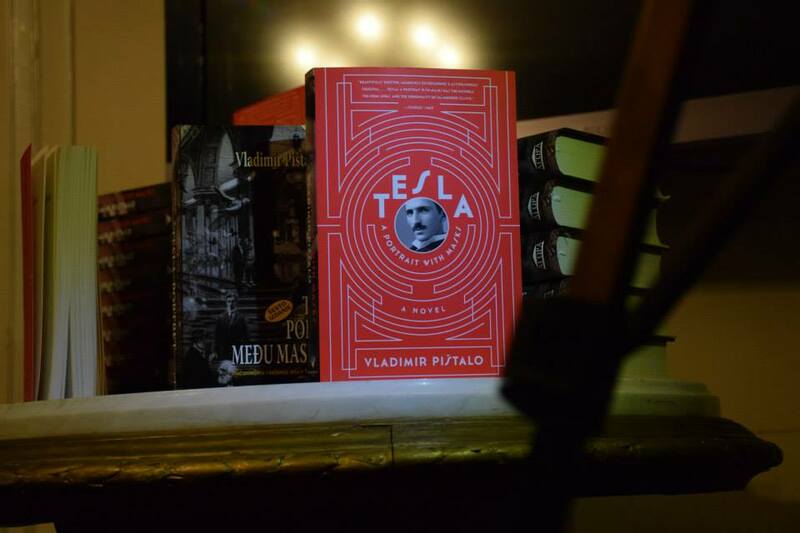 April 2, 2015 Washington – The Embassy of Serbia hosted a presentation of the book “Tesla: A Portrait with Masks” by a renowned Serbian writer Vladimir Pistalo. Since it was published in Serbia in 2008 it became a bestseller and was awarded with NIN Literary Prize for the best novel of the year. Since then tho book has been translated to 10 European languages.The first US edition was published in 2015 and has already received excellent literary reviews in the US. Belgrade, 26 March 2015 – The Ministry of Construction, Transport and Infrastructure announced that the government of Serbia adopted the present text of the Agreement on Air Transport between the governments of Serbia and the United States on direct flights between the two countries. The signing of the agreement is expected soon in Belgrade. On behalf of the government of Serbia, the document will be signed by Deputy Prime Minister and Minister of Construction, Transport and Infrastructure Zorana Mihajlovic. This agreement will govern the conditions for the conduct of air traffic between the two countries. After nearly 16 years, this will be the first line in the region of the former Yugoslavia to have direct overseas flights. 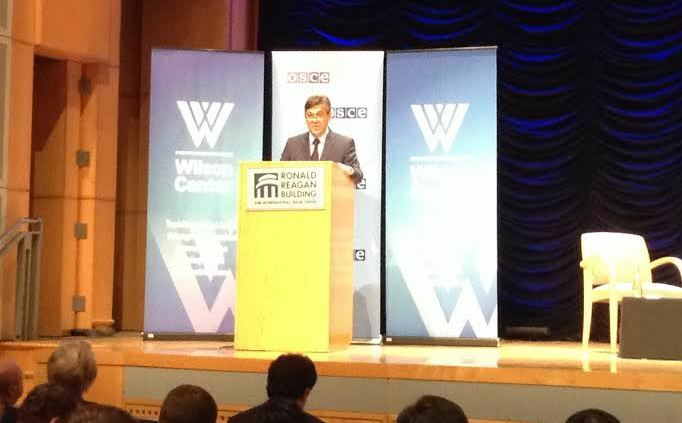 Washington, D.C., March 17, 2015 – The Woodrow Wilson Center organized the OSCE Security Days Conference, first held outside of Vienna. It brought together foreign ministers, ambassadors and prominent leaders to discuss current challenges in the Euro-Atlantic security. The Conference was composed of four panels discussing topics of Ukraine and Euro-Atlantic Security, Afghanistan and Central Asia, Preventing Radicalization that leads to Terrorism and Strategies for Future. Prominent participants included OSCE Secretary General Amb. Lamberto Zannier, Amb. Dejan Sahovic, Head of Serbian Chairmanship Task Force, Deputy Foreign Ministers of Kazakhstan and Afghanistan, Ambassadors of the Russian Federation and Ukraine to US, Permanent Representative of Germany to the OSCE. In his remarks Ambassador Dejan Sahovic, Head of the Serbian OSCE Chairmanship Task Force, laid out priorities of the Serbian Chairmanship in 2015 and highlighted the added value of the joint Swiss-Serbian cooperation that provided continuity and institutional stability. He stressed that Serbia will build upon the cooperative and inclusive nature of the OSCE that recently brought about the joint decision of 57 member states on a new 12 month mandate of the Special Monitoring Mission for Ukraine and resources for its operations. Regarding the upcoming activities of the Serbia OSCE Chairmanship he informed about the Panel of Eminent Persons, “Helsinki Plus 40“ Process and the Ministerial Meeting to be held in Belgrade later in December of this year. Belgrade, 10 March 2015 – Prime Minister Aleksandar Vucic and US Ambassador to Serbia Michael Kirby spoke today about concrete American investments in Serbia, investments of American companies and the speedy creation of a better investment environment in the country. During the talks, it was underlined that it is necessary to invest in smaller places too so that the survival of local population could be ensured, as well as more even regional development of Serbia. 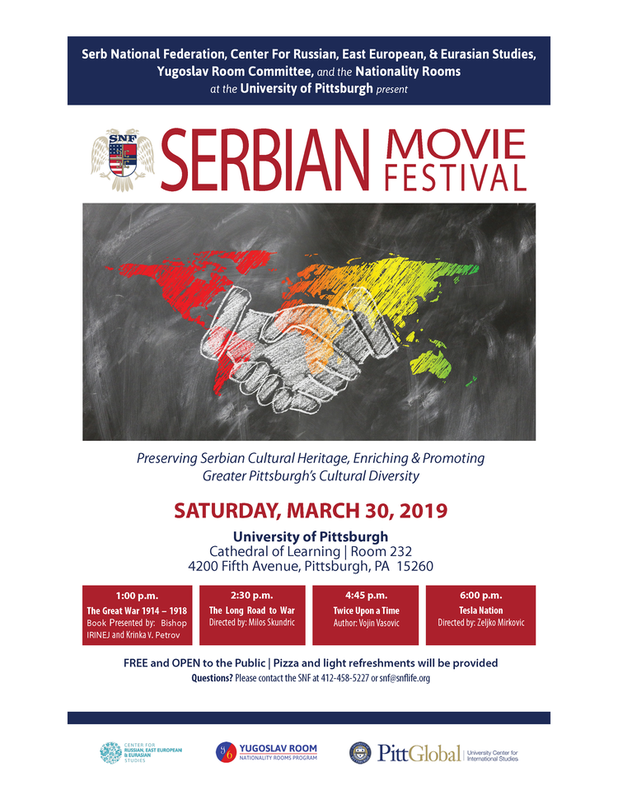 The Embassy of Serbia is pleased to announce its participation at the Smithsonian DC Francophonie Cultural Festival that is taking place every year during the month of March in Washington, D.C. The movie will be screened at the Alliance Francaise, on Saturday, March 21 at 3.30 pm. The annual Francophonie Cultural Festival spotlights the music, art, literature, film, cuisine, and customs of French-speaking countries and regions from across the globe, and its closing celebration is always magnifique. This year’s bash will be no exception. Friday, March 27, from 7 PM to 11 PM. Beginning at 7 p.m., launch into a world tour of francophone cultures. Sample food and drink from more than 30 embassies as you explore each nation's unique attractions and traditions. There will be plenty of giveaways for you to take home as souvenirs. DJ Princess Slaya spins music from Africa, the Caribbean, Europe, and plenty of destinations in between. 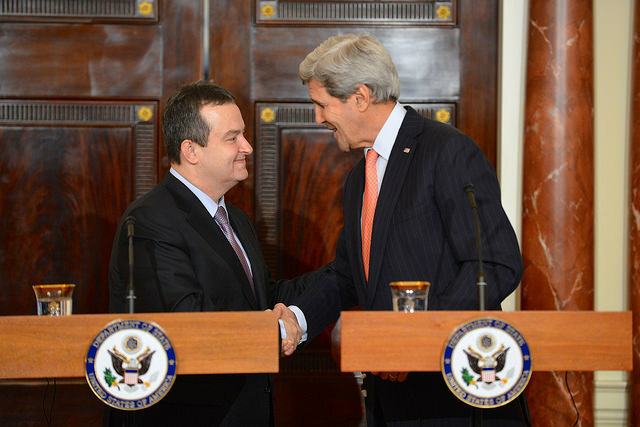 Belgrade/Washington, 26 Feb 2015 – First Deputy Prime Minister and Foreign Minister Ivica Dacic, who is also Chairman of the Organisation for Security and Cooperation in Europe (OSCE), met in Washington today with US Secretary of State John Kerry. Dacic said at a joint press conference before the meeting that Serbia attaches great importance to bilateral relations with the United States, especially in times when it is chairing such an important international organisation as the OSCE. As a chair country, we will be faithful and true to the principles on which the OSCE is based, since the former Yugoslavia was one of the founders, Dacic stated. He said that the Serbian Chairmanship will make every effort to have good communication with the 57 OSCE member states on the area from Vladivostok to Vancouver and to coordinate its work with the most important political factors. Dacic said that at the meeting with the US Secretary of State, they will not only discuss the work of the OSCE, but also bilateral relations between Serbia and the United States. It is a great satisfaction for me that our bilateral relations in recent years have been moving upward. It is very important to restore the strategic partnership that the United States and Serbia had a long time ago, 100 years ago, Dacic underlined and recalled that our bilateral diplomatic relations were established more than 130 years ago. Serbia’s First Deputy Prime Minister and Minister of Foreign Affairs, H.E. Ivica Dačić, will testify before the Helsinki Commission in his capacity as Chairman-in-Office of the OSCE. He takes the helm to conclude the implementation of a joint leadership plan developed with Switzerland, which chaired the OSCE in 2014. Minister Dačić is expected to discuss the Serbian Chairmanship-in-Office’s priorities, including resolution of the conflict in and around Ukraine; reconciliation and cooperation in the Western Balkans; reforming security sector governance; combating transnational threats, including foreign terrorist fighters, terrorism, and cyber-security; safeguarding journalists; fostering freedom of expression, assembly, and association; combating organized crime and its linkages to human trafficking; combating corruption; and improving water governance. He will also provide insights regarding the ongoing work of the OSCE. Serbia’s 2015 Chairmanship-in-Office of the 57-nation Organization for Security and Cooperation in Europe (OSCE) comes at a pivotal point in European security. 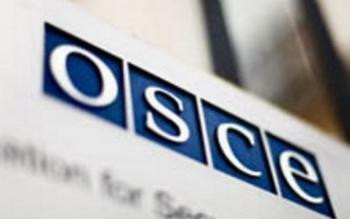 The OSCE, a regional security organization based known for its work in promoting democracy, human rights, and the rule of law, operates on the front lines of Russia-Ukraine conflict and seeks to counter backsliding on human rights in other countries of the OSCE region. Belgrade, 10 Feb 2015 – Prime Minister Aleksandar Vucic spoke today with US Deputy Assistant Secretary for European and Eurasian Affairs Hoyt Yee and US Ambassador to Serbia Michael Kirby. The American diplomats congratulated the Serbian Prime Minister on initialling the Judiciary Agreement yesterday in Brussels, and described it as a great success that confirms the dedication of the Serbian government to dialogue with Pristina. PM Vucic underlined that it is his job to work the hardest and best for his people in Kosovo-Metohija and central Serbia. The collocutors also examined the process of European integration, and Vucic said he expects the US support to Serbia's European path. One of the topics discussed was the bilateral cooperation between Serbia and the United States, particularly in light of the meetings of the PM Vucic with US Vice President Joseph Biden and Assistant Secretary of State Victoria Nuland during the Securiy Conference. February 10, Washington D.C. - Embassies of Serbia and Switzerland co-hosted a reception at the Residence of the Swiss Ambassador to celebrate the close cooperation between the Serbian and the Swiss Chairmanships and thank for the support during Switzerland’s Chairmanship of the OSCE in 2014. Ambassador of Serbia Matkovic highlighted the important role the OSCE plays in Europe adding that at the Munich Security Conference OSCE received this year’s Ewald von Kleist Award for the outstanding contribution to international peace, stability and security in Europe. Regarding the situation in Ukraine ambassador Matkovic said that although a small nation, as a current chair of OSCE Serbia will make the utmost efforts to contribute to the peaceful solution of the current crisis. 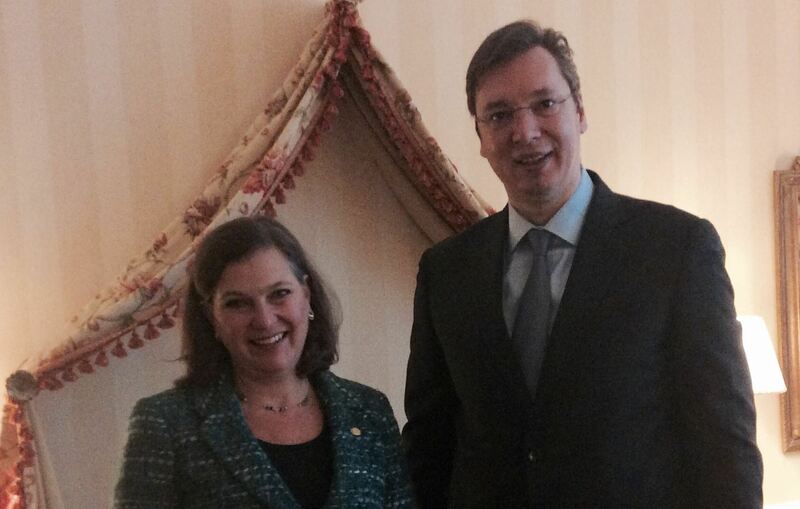 Munich, February 7 - Serbian Prime Minister Aleksandar Vucic met with U.S. Assistant Secretary of State Victoria Nuland in Munich on Saturday to discuss the bilateral relations, primarily in the energy sector, and the possibility of the US supplying gas to Serbia. Nuland expressed support for Serbia's European path and the resumption of the EU-facilitated dialogue between Belgrade and Pristina, the government's press office said in a release. February 4, 2015 - First Deputy PM and Minister of Foreign Affairs Ivica Dačić arrived to Washington DC for a three-day visit to the United States. On 5th of February he will attend the 63rd National Prayer Breakfast and meet with senior State Department officials and Serbian Caucus in the US Congress. Minister Dacic will meet with the Assistant Secretary of State for European and Eurasian Affairs, Ms. Victoria Nuland, Co-Chairs of the Serbian Caucus, Congressman Emanuel Cleaver and Congressman Ted Poe, as well as with Senator Chris Murphy. On February 6 Minister Dacic will participate in the session of the UN Security Council to discuss the new UNMIK report which covers the period from October 16, 2014 to January 15, 2015. 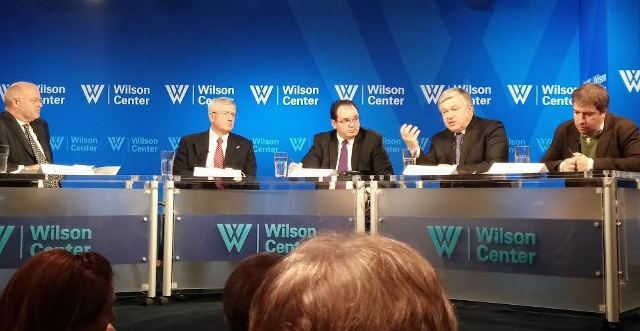 On January 29 the Wilson Center hosted the panel discussion “Security Challenges in Europe in 2015”. The panelists included Martin Dahinden, Ambassador of Switzerland to the US, John Milton Cooper, Senior Scholar Professor Emeritus, University of Wisconsin, Vladimir Jovičić, Charge d'Affaires, a.i. Embassy of Serbia to the US, Oleksandr Chalyi, Former First Deputy Minister for Foreign Affairs of Ukraine and Maxim Trudolyubov, Fellow, Opinion Page Editor, Vedomosti Daily, Russia. The discussion aimed at providing a broad view of European security challenges in 2015. Particular emphasis was placed on the priorities of the Swiss Chairmanship of the OSCE and what remains to be done following the transition to Serbian Chairmanship. 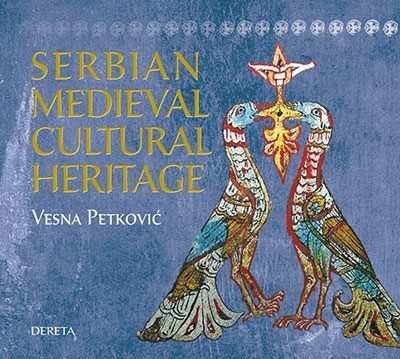 "Serbian Medieval Cultural Heritage" by Vesna Petkovic. Belgrade/Vienna, 16 Jan 2015 – First Deputy Prime Minister and Foreign Minister Ivica Dacic spoke yesterday in Vienna, where he presented to the OSCE Permanent Council priorities of Serbia’s chairmanship of the OSCE, with heads of OSCE field missions and institutions of this organisation. Dacic, who is also Chairperson-in-Office of the OSCE said that Serbia, as a country in which the OSCE has long been present, attaches great importance to this organisation’s field missions, whose activities will be supported during the country’s chairmanship. He noted that regional cooperation is one of the priorities of the presidency, and added that good neighbourly relations are not something that should be taken for granted, but must be nurtured. The First Deputy Prime Minister said that the most important task during Serbia’s chairmanship of the OSCE will be to work on securing the return of peace and stability in Ukraine. Speaking about cooperation with institutions of the OSCE, Dacic underlined that Serbia will intensify its good cooperation with them during its chairmanship. 14 January 2015 - The OSCE Chairperson-in-Office, Serbia’s Foreign Minister Ivica Dačič today strongly condemned yesterday’s deadly incident in which several people were killed and wounded on a bus near a government-controlled checkpoint in Buhas, eastern Ukraine. "I condemn in the strongest terms this attack on innocent passengers. I am appalled by this incident and its tragic outcome, and express my deepest sympathy to the families of the victims." “This incident comes as the situation in the east of the country has significantly deteriorated and I call on all sides to immediately halt the use of force, exercise restraint, return to negotiating table and implementing both the letter and the spirit of the Minsk documents." Belgrade, 9 Jan 2015 – Prime Minister Aleksandar Vucic chaired this year's first meeting of the Office for coordination of security services which discussed the current security situation, activities dedicated to the prevention of possible terrorist activities and the fight against corruption. It was concluded that peace, priorities, stability and security of the citizens of Serbia are task of all competent authorities. 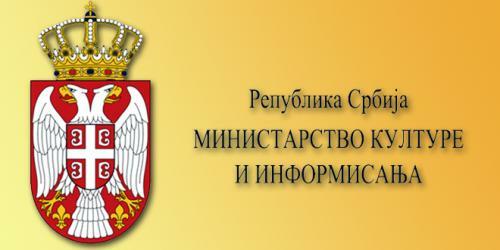 In addition, a permanent mixed working group on combating terrorism in the Republic of Serbia was formed. 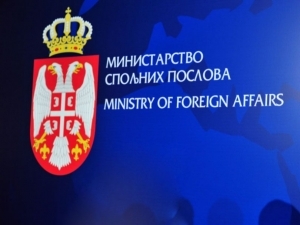 Belgrade, 31 Dec 2014 – The Serbian government adopted at today's session the National Strategy for Combating Money Laundering and Financing of Terrorism, which includes strategic planning, coordination and cooperation of all institutions in order to decrease the risk of money laundering and terrorism financing. The strategy is also aimed at preventing the introduction of the assets that are suspected to be the proceeds of crime into the financial system and other sectors, as well as the detecting and prosecuting the offenders and confiscating the illegally acquired assets. The national strategy covers the period to 2018 and provides for the formation of professional teams that will work on the prevention of money laundering and terrorism financing​. 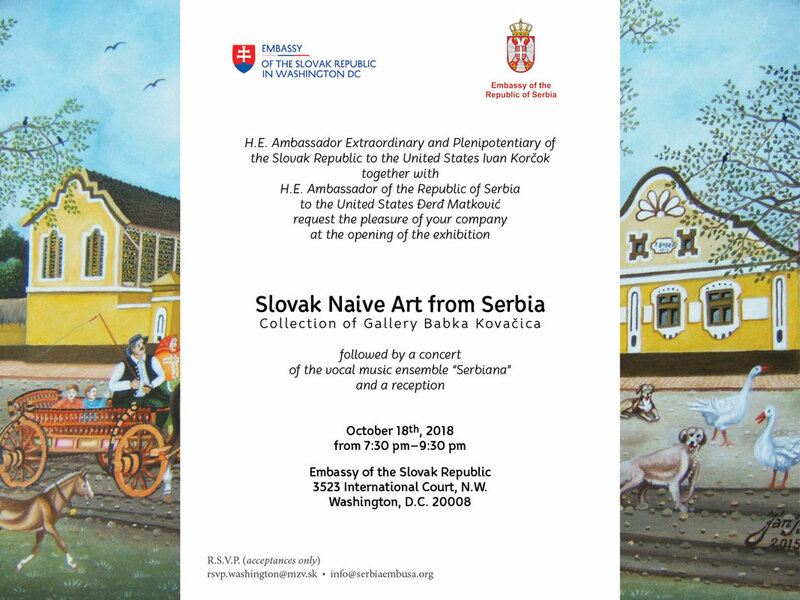 Washington DC, 11.October 2014 - President of the Republic of Serbia, Mr. Tomisalv Nikolić awarded posthumously a Gold Medal Of Merit to Stella Jatras, US diplomat, analyst and writer for outstanding achievements in public and cultural activities and presentation of Serbia in the U.S. 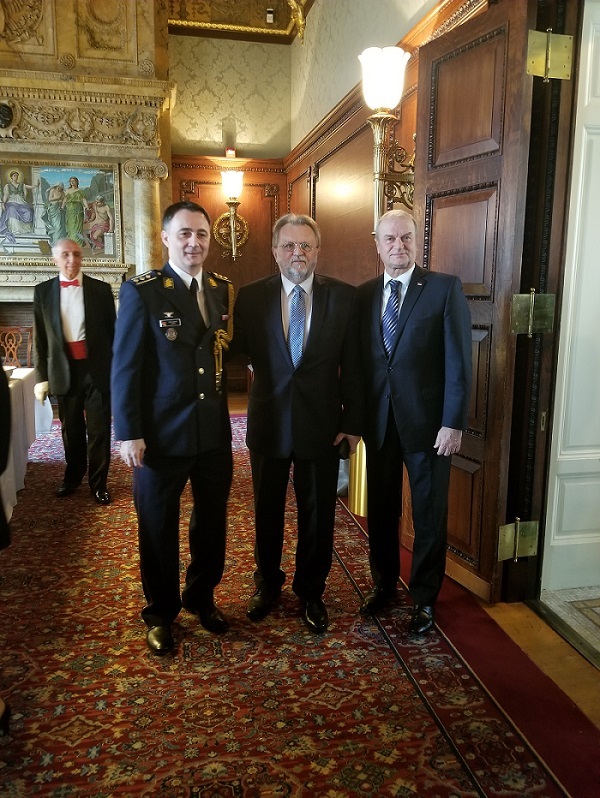 The medal was handed over to the Jatras family by Adviser to the President of Serbia, Mr. Oliver Antic, during the ceremony at the Embassy of Serbia. 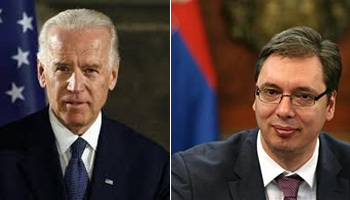 Belgrade, 6 Oct 2014 – Prime Minister Aleksandar Vucic spoke this evening with Vice President of the United States Joseph Biden, who expressed his appreciation and support to reforms that Serbia started implementing. In a telephone conversation, Vucic and Biden discussed bilateral Serbian-US political and economic relations. 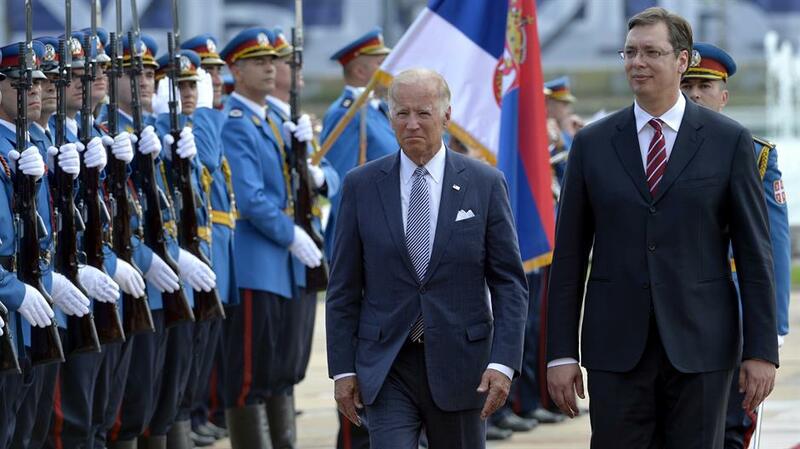 Biden expressed his hope that Serbia will remain a factor of stability in the whole region of the Western Balkans. The Prime Minister said that Serbia is committed to its European path, and that it will start with strict economic reforms, as its citizens want, in order for Serbia to become a successful and modern country. Also, Vucic and the US Vice President exchanged views on the global political and economic trends. The Ambassy of the Republic Serbia in Washington DC invites all classical music lovers to join us in welcoming the Belgrade Philharmonic Orchestra at the concerts in the United States. Belgrade/Berlin, 28 Aug 2014 – First Deputy Prime Minister and Minister of Foreign Affairs Ivica Dacic said today in Berlin to the Western Balkan region is a region of peace and stability, adding that it expects to soon join the European Union. At a conference on the Western Balkans within a ministerial panel on "Economic Management and Joining the EU", Dacic in his address expressed gratitude to the government of the Federal Republic of Germany and Minister for Foreign Affairs Frank-Walter Steinmeier on the initiative and his personal commitment to ensure that these conference be held. The First Deputy Prime Minister pointed out that the new approach to the EU, in accordance with which chapters 23 and 24, relating to the rule of law and fight against corruption, should be opened at the beginning of the negotiation process, in the best interest of the candidate countries. He said that European integration is the most effective and quickest way to achieve high standards in these areas, which are crucial for the overall development of the state and society and for ensuring economic growth and social prosperity. According to Dacic, Serbia's priority is the rule of law, as a prerequisite for attracting foreign investments and activation of small and medium enterprises in the country. He recalled the 2013 Judicial Reform Strategy and the Strategy for the Fight against Corruption, which specifies in detail all the measures and timetable for implementation. He emphasised bilateral assistance and support of Germany in this field. The First Deputy Prime Minister said that efforts should be made to improve the regulatory framework and law enforcement, as well as to build a culture that has zero tolerance towards corruption. Dacic said Serbia does not expect the EU to lower its criteria for membership. We consider that it is significant every country moves towards the EU at its own pace, said Dacic. "Our friendship with the Serbians is based on our shared belief in democracy and standing up for liberty. During both World War I and World War II, our two countries fought on the same battlefield and our people shared and shed blood together. Because of that brotherhood, we have a special relationship." Screenings of the selected films will be shown starting at 8 PM on both days at The Avalon Theater, 5612 Connecticut Avenue, NW, Chevy Chase, Washington, DC. All movies are with subtitles. PROCEEDS OF THIS EVENT WILL BENEFIT SERBIAN FLOOD RELIEF! Bring your friends and join us! Diplomatic and consular missions of the Republic of Serbia in the United States and Canada would like to thank all humanitarian and non-profit organizations registered in the U.S. and Canada for their work and activities in collecting humanitarian aid for the flooded areas in Serbia. On this occasion we would like to emphasize that no organization or Diaspora association has received from the Government of the Republic of Serbia the exclusive right to collect and send humanitarian aid. Diplomatic and consular missions of Serbia highly appreciate efforts of all organizations, associations, individuals, Serbian Diaspora clubs and the Serbian Orthodox Church to collect humanitarian aid. We will continue to provide assistance to all interested organizations and individuals so that the humanitarian aid reaches to the people in need. Belgrade, 29 April 2014 – The former Prime Minister Ivica Dacic handed over today this duty to the newly-elected Prime Minister Aleksandar Vucic at the Serbian government building. Prime Minister Vucic and Dacic, who in the new government has the position of Deputy Prime Minister and Minister of Internal Affairs, stated on this occasion that there is a lot of work ahead of Serbia and that the aim of this government is to do something for the country by which it will be remembered by future generations. They announced a rich diplomatic activity and especially referred to yesterday’s visit of EU High Representative for Foreign Affairs and Security Policy Catherine Ashton, who expressed support to the new government of Serbia. Vucic recalled that in 2015 Serbia will preside over the OSCE, which means that the Minister of Foreign Affairs will have a lot of work. He announced that European Enlargement Commissioner Stefan Fule and Sheikh Mohammed bin Zayed will soon visit our country. Dacic also gave Vucic the Report on the government’s work and expressed satisfaction with their mutual cooperation to date and results of the previous government’s work over the last two years, and first of all with the fact that Serbia’s image in the world has been improved. He noted that he will have a lot of work on his new position, and recalled that Serbia will chair the OSCE and that the Summit of the countries of the EU and Western Balkans will soon be held in Greece. Dacic announced that a meeting of Council of Europe foreign ministers will soon be held, at which the situation in Ukraine will be looked at. He presented Vucic with a replica of a mythological creature from the Ravanica monastery, which has the body of a lion and the head of an eagle. Belgrade, 28 April 2014 – Prime Minister Aleksandar Vucic said today that Serbia will be the first country in this part of Europe to launch talks on chapters 23 and 24, related to the rule of law, as soon as next year. Vucic expressed the hope at a news conference after a meeting with EU High Representative for Foreign Affairs and Security Policy Catherine Ashton that our country will receive assistance from the EU in this process, as promised by Ashton today. The arrival of the EU High Representative to Belgrade on the first day after the formation of the new government of Serbia is a great honour and a good sign for our country, he said and expressed his appreciation for such an act, but also for everything that Ashton has done for Serbia. Vucic said that a great deal of merit goes to Ashton for the fact that Serbia is on its path towards EU membership and for the acceptance of the Brussels agreement, noting that she, more than many others in the Union, wanted to hear Serbian views, comments and needs. Belgrade, 27 April 2014 – Members of Serbian parliament elected today the new Serbian government with Aleksandar Vucic in the office of the Prime Minister. The Prime Minister and members of the Serbian government took an oath of office after the MPs voted. The oath of office is as follows: "I pledge to be loyal to the Republic of Serbia and promise with my honour to obey the Constitution and laws, and to carry out the duty of a government member conscientiously, responsibly and diligently, committed to preserving Kosovo-Metohija within the Republic of Serbia." 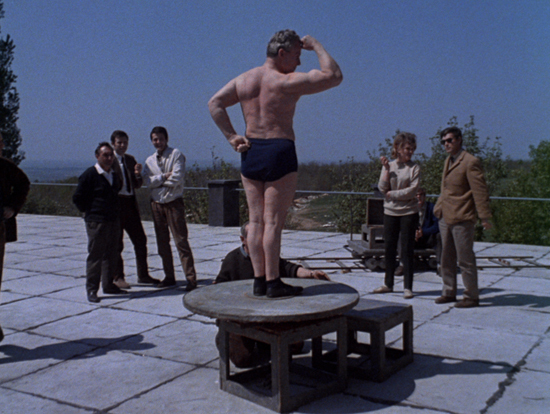 Though it is justly associated with political restrictions on creativity and meager resources, the Cold War era in the former Eastern Bloc nevertheless saw film and video makers creating independent and experimental work on their own terms. This series focuses on films that defied the established traditions of both narrative and documentary cinema and were produced outside large state-run studios. 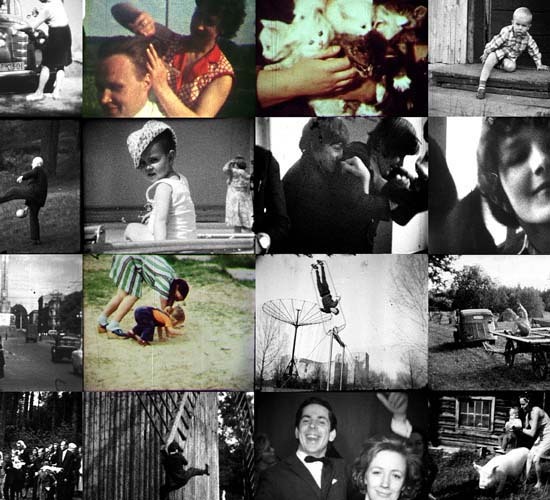 Borrowed from archival collections across the region—including Poland, Hungary, Croatia, Serbia, Slovenia, Latvia, Estonia, and the Czech Republic, as well as U.S. and Western European archives and the personal archives of several filmmakers—the films offer fresh insights into the artistic explorations of time-based media undertaken by artists and amateurs, as well as by professional filmmakers in the region. Seen today, these titles seem as potent as any work produced contemporaneously in the Cold War West. With special thanks to the Embassy of the Republic of Poland, the Embassy of the Republic of Croatia, and the Embassy of the Republic of Serbia. Belgrade, 7 April 2014 – Prime Minister Ivica Dacic and Ambassador of the United States to Serbia Michael Kirby agreed at today's meeting that relations between the two countries are on the rise and that there is great potential for improving economic cooperation. Dacic said that in dialogue with Pristina in Brussels Serbia seeks to reach a fair solution that will ensure complete safety and survival of Serbs in Kosovo-Metohija and a stable peace in the region. Special attention is devoted to the discussion of the importance of strengthening institutions in Serbia that will strongly support economic development and the process of European integration. Belgrade, 24 March 2014 – On the occasion of the Remembrance day of the victims of the NATO bombing, Prime Minister and Minister of the Interior Ivica Dacic laid a wreath at the memorial on the hill Strazevica in Rakovica. 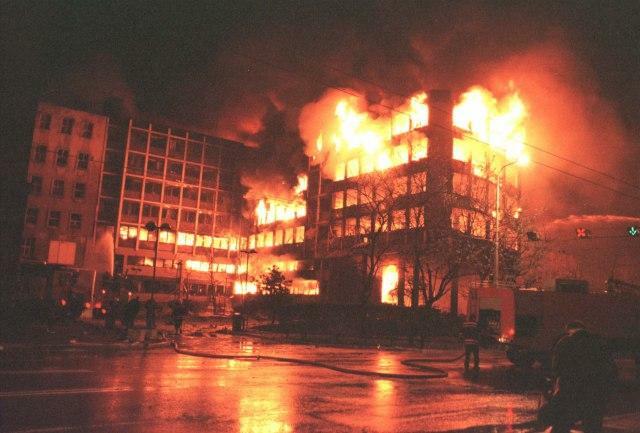 Today, 15 years after the NATO bombing, more and more voices are being heard in the international community saying that there was no legal framework for the bombing of Serbia, Dacic underlined and reiterated that situations like this one must never happen again. The Prime Minister said that Serbia today conducts a policy of solving all problems through peaceful means. The bombing of the Federal Republic of Yugoslavia began on 24 March 1999, at the order of the then NATO Secretary General Javier Solana. On the same night, the Yugoslav government declared a state of war and the attacks of the NATO aviation lasted for the next 78 days. In these attacks, at least 2,500 people died, and over 12,500 were wounded or injured, according to estimates. Dimitrije Vasiljevic is an award-winning, New York-based jazz pianist and composer who weaves Balkan motifs into European jazz. 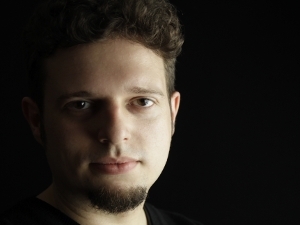 Hailing from Serbia, he is a graduate of Berklee College of Music and the NYU Steinhardt School. At this Carnegie Hall debut, Vasiljevic showcases his original compositions and several jazz standards in his own arrangements. Belgrade/Washington, 7 Feb 2014 – Prime Minister and Minister of the Interior Ivica Dacic said in Washington that he spoke with new Director of the Federal Bureau of Investigation (FBI) James Comey about very good cooperation between the American and Serbian services and the opening of FBI offices in Belgrade. Belgrade, 5 Feb 2014 – Prime Minister Ivica Dacic will pay a visit to the United States of America, where on 10 February he will participate in a meeting of the UN Security Council dedicated to the situation in Kosovo-Metohija. Dacic will confer with FBI Director James Comey on 6 February in Washington. Also, the Prime Minister of Serbia will meet with Congressmen Robert Aderholt and Ted Poe in Washington. On 7 February, Dacic will meet with Deputy Secretary of State William Burns and Deputy Director of the Drug Enforcement Administration (DEA) Thomas Harrigan. Dacic will also attend the prayer breakfast organised by the President of the United States Barack Obama. 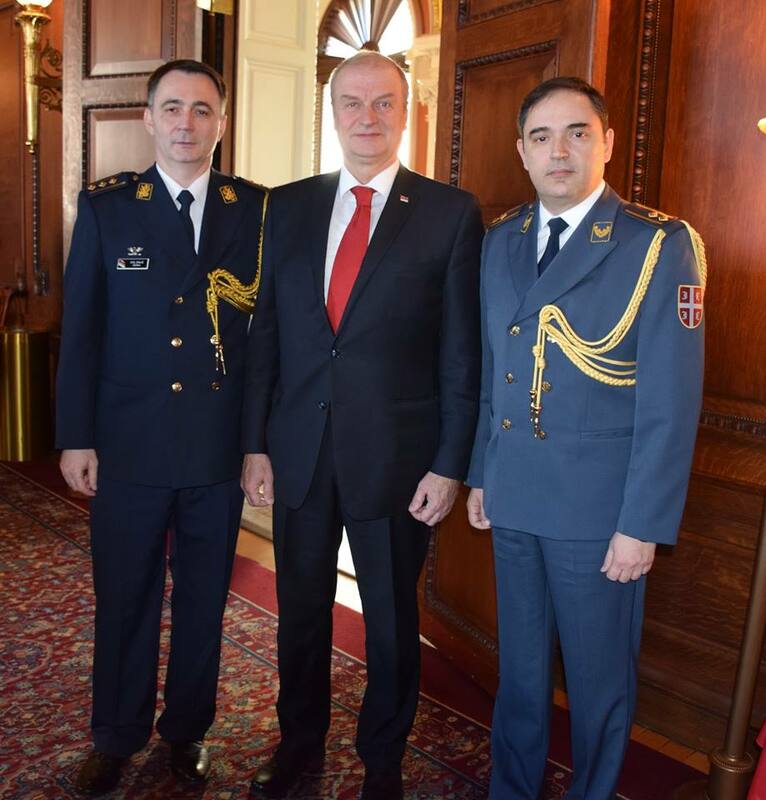 The Minister of Defence of the Republic of Serbia , Nebojsa Rodic arrived in Washington, the USA. During the official working visit , a series of bilateral meetings are planned with officials from the Pentagon , State Department , National Guard Bureau , the Defense Intelligence Agency , the National University of Defense and the US Congress. In addition to bilateral meetings , the defense minister will sign two agreements. In the Pentagon the minister will meet with the United States Secretary of Defense Charles Hagel where these two officials will sign an Agreement between the Government of the Republic of Serbia and the Government of the United States on security measures for the protection of classified military information, while during his visit to the State Department minister will sign the agreement on enhancing cooperation and the status of forces within the framework of the Partnership for Peace Program. will also be received by the chief of the US National Guard Bureau General Frank Grass, director of the Defense Intelligence Agency, Lieutenant General Michael Flynn and the President of the US National Defense University , Maj. Gen. Greg Martin. In addition to these meetings, the defense minister will visit the members of the Ministry of Defense and the Army of Serbia, who are currently in training at the National University of Defense of the United States. 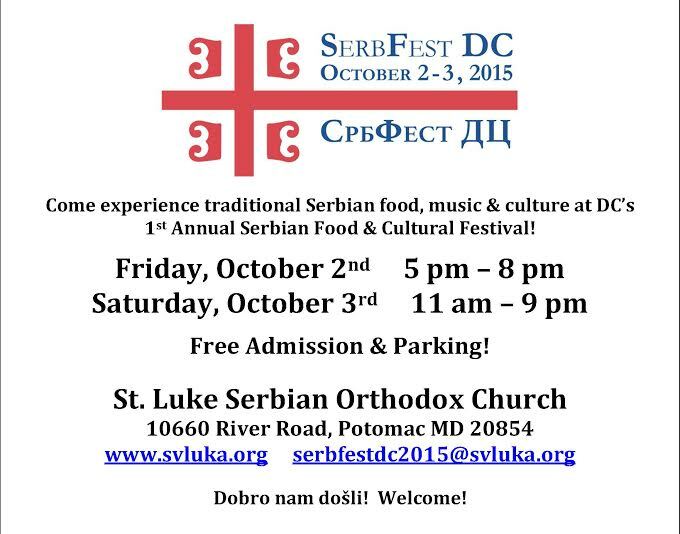 on the occasion of Saint Sava, in the organization of the Serbian diaspora in Washington . Belgrade/Brussels, 21 Jan 2014 – Prime Minister Ivica Dacic and First Deputy Prime Minister Aleksandar Vucic led in Brussels today a Serbian delegation at the First intergovernmental conference between Serbia and the EU, which officially marked the beginning of negotiations on the accession of our country to the EU. Speaking at a press conference after the First intergovernmental conference, Dacic underlined that historically this is the most important event for Serbia after World War II, and that as of today Serbia is formally part of the process of accession to the joint family of European nations. He thanked the EU for the assistance it has provided to our country to get to this day, and highlighted the contribution of EU High Representative for Foreign Affairs and Security Policy Catherine Ashton, who was a key factor in coming to a compromise in dialogue between Belgrade and Pristina, and of European Enlargement Commissioner Stefan Fule, who worked patiently over the years to create the conditions so that he could write in his report that Serbia deserves to get candidate status and open the negotiations. Belgrade, 13 Jan 2014 – Minister of Transport Aleksandar Antic spoke today with US Ambassador to Serbia Michael Kirby about cooperation between the two countries, with a special emphasis on cooperation in the field of air transport. A statement by the Ministry of Transport says that during the meeting it was underlined that in order to attract investments from the US, Serbia must build a good transport infrastructure. Kirby said there is an increased interest of US investors for Serbia, pointing to highly qualified labour and many advantages for production and further export of goods and services as Serbia’s strong points. Speaking about cooperation in air transport and safety issues, Antic voiced his hope that at the meeting to be held on 24 March the US Federal Aviation Administration will confirm Serbia’s progress in this field. 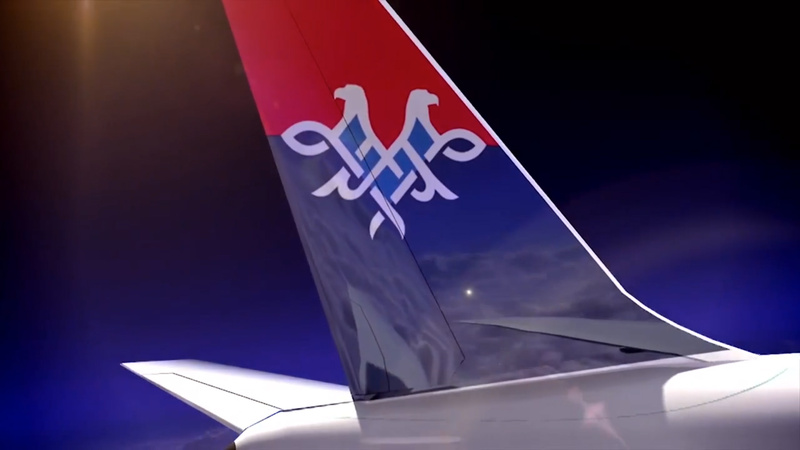 Bearing in mind our country’s ambition to become the regional leader in air transport, such a decision would be of great importance and would enable the national air carrier Air Serbia to fly to the United States, Antic underlined. Who is eligible to apply? Institutions, artistic and other associations and organizations/entities, registered in the Republic of Serbia and outside the territory of the Republic of Serbia, and publishers registered solely or mainly in the field of publishing industry, outside of the Republic of Serbia. Who is not eligible? Cultural institution founded by the Republic of Serbia. The competition is open from December 21, 2013 to March 21, 2014. Belgrade/Brussels, 20 Dec 2013 – President of the European Council Herman van Rompuy officially confirmed today that the accession negotiations with Serbia will start on 21 January of 2014, and that all EU member states approved the negotiating framework for Serbia. Rompuy told a press conference held after a two-day summit of heads of state and government of the EU in Brussels that at the first intergovernmental conference, the EU will be represented by Greece, which as of 1 January 2014 will take on a six-month presidency of the EU. He expressed the hope that the first chapters will be opened in the second half of 2014, and added that the negotiating framework adopted today provides the opening of chapters 23 and 24, relating to the judiciary, police, and basic human rights. He added that Chapter 35 (various issues), including normalisation of relations between Belgrade and Pristina, will be opened at the same time. 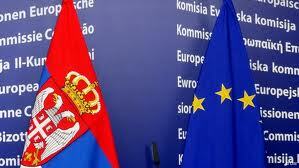 Belgrade, 17 Dec 2013 – Prime Minister Ivica Dacic announced tonight that the accession talks of the EU with Serbia will start on 21 January. In a live broadcast on RTS, Dacic said that the EU foreign ministers’ decision adopted in Brussels tonight to hold the first intergovernmental conference of Serbia and the EU in January is a historic event, which has been waited for by many generations and which has been the goal of many previous governments in Serbia. Belgrade, 10 Dec 2013 – Prime Minister Ivica Dacic and Director of the Office of South -Central European Affairs of the US State Department Jonathan Moore pointed out in a meeting today that the United States supports Serbia's European path and reforms undertaken by the government of Serbia. Dacic and Moore emphasised that dialogue between Belgrade and the provisional institutions of government in Pristina and the implementation of the agreement reached in Brussels have a positive impact on stabilisation of the situation in the region, and that local elections in Kosovo were well organised. The Prime Minister stressed the commitment of the government of Serbia that all outstanding issues be resolved efficiently and in a timely manner. He expressed confidence that the intergovernmental conference on Serbia’s EU accession will be held as soon as possible, i.e. no later than January next year, given that the government has adopted all the necessary documents for negotiations. Dacic said that Serbia's interest is to promote political dialogue and enhance economic cooperation with the United States. 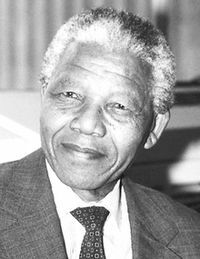 Belgrade, 6 Dec 2013 – The Serbian government ordered at its session today that all flags in the Republic of Serbia be taken to half-mast today in order to mark the death of former president of South Africa Nelson Mandela. Belgrade, 22 Nov 2013 – Prime Minister Ivica Dacic spoke late today with US Deputy Assistant Secretary of State for European and Eurasian Affairs Hoyt Brian Yee. Yee underlined that the United States supports efforts the Serbian government is making in the implementation of the Brussels agreement. The United States fully supports Serbia’s European path, the reform course of the Serbian government and it welcomes talks with Pristina regarding the resolution of problems in Kosovo-Metohija, Hoyt Brian Yee underlined. Dacic said that the Serbian government is trying to improve relations with the United States and pointed to numerous opportunities for boosting economic cooperation. The Prime Minister underlined that in the first nine months of the year, the export from Serbia to the United States increased by 70% in relation to the same period last year and voiced his hope that American companies will invest in Serbia. Belgrade/New York, 20 Nov 2013 – Prime Minister Ivica Dacic said in New York that American businessman and investor Donald Trump is interested in building an exclusive hotel in Belgrade and that in the next two months he will send a team of his associates to look for an appropriate location. 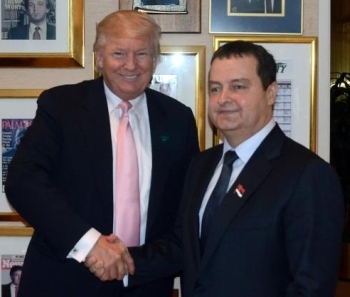 Dacic said after meeting with Trump that they discussed the possibility of finding a location for the construction of a luxury hotel within his chain of hotels. For Serbia and Belgrade that would be good news, which would greatly contribute to the country's image, but would also attract other serious investors, Dacic said. Trump has also shown interest in other areas, such as energy, said Dacic. 18 Nov 2013. Prime Minister Ivica Dacic will be on a two-day working visit to the United States of America (US) on 18-19 November, during which he will participate in the work of the UN Security Council session (SB UN). On 18 November Dacic will meet US representative to the UN Samantha Power and with Permanent Representative of Russia to the UN Vitaly Churkin. The Prime Minister will hold a meeting with representatives of companies General Electric and Kohlberg Kravis Roberts. The Prime Minister will also attend a cocktail party hosted by President and Chief Executive Officer of the New York Academy of Sciences Ellis Rubinstein. On 19 November Dacic will participate in the work of a UN Security Council session. Before the session, the Prime Minister will meet with Permanent Representative of China to the UN and the current President of the UN Security Council Liu Jieyi. Belgrade/London, 12 Nov 2013 – Serbia’s no.1 tennis player Novak Djokovic defended his title at the ATP World Tour Finals in London after beating last night Spaniard Rafael Nadal 2-0 in sets, 6-3, 6-4. This is Djokovic’s seventh title this year and the third victory at final masters tournaments in his career. Previously, Djokovic had qualified for the finals of the London tournament after defeating Swiss Stanislas Wawrinka 2-0 in sets, 6-3, 6-3. 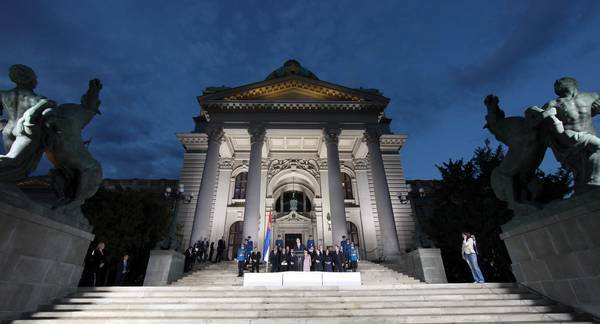 Belgrade, 11 Nov 2013 – Prime Minister Ivica Dacic laid a wreath today at the Mausoleum to Defenders of Belgrade in the First World War. The observation ceremony of the Armistice Day in the First World War was attended by representatives of the Serbian government, Serbian Army, City of Belgrade, as well as ambassadors and foreign envoys. The central state ceremony held next to the Mausoleum to Defenders of Belgrade has been held in order to pay tribute to all soldiers and civilians who fell innocent victims during the First World War. 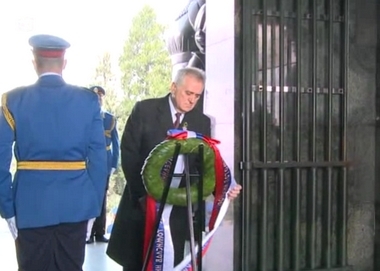 Serbian President Tomislav Nikolic laid a laurel wreath to the Tomb of the Unknown Soldier on Avala with full military and state honours. The wreath, laid with the sounds of the state anthem “God of Justice”, carried an inscription: “To the soldiers of the great war by their proud descendants – President of the Republic Tomislav Nikolic.” After the wreath-laying ceremony, Nikolic signed the book of impressions. The Serbian delegation also included Minister of Defence Nebojsa Rodic and Chief of the Serbian Army General Staff General Ljubisa Dikovic. The Armistice Day is observed around in the world with various events in the memory of 11 November 1918 when the armistice took effect at 11.00. Belgrade, 7 Nov 2013 – Prime Minister Ivica Dacic said today in a meeting with Vice President of US company Intel John Davis that the Serbian government supports the rapid development of information technology in Serbia in cooperation with major international companies in IT sector. 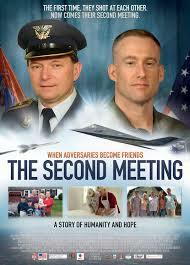 The movie is the Serbian candidate for the 2014 Oscar Award for the best feature documentary. In March 1999 during the Balkan conflict, Serbian missile officer Zoltan Dani shot down Dale Zelko, the American pilot of an F117A stealth aircraft. That was their first encounter. Twelve years later, they reunited as friends. The Second Meeting traces the emotional journey of two people culturally, socially, and geographically apart, brought together by a random act of war. It’s a poignant, uplifting story of how the bonds of friendship can be forged on the battlefield, even amongst adversaries. Directed by Zeljko Mirkovic, an award-winning documentary filmmaker and producer, the movie premiered in Belgrade on September 21, 2012. Belgrade, 4 Nov 2013 – Prime Minister Ivica Dacic said today that the sector of information technology (IT) has a great potential for economic development in Serbia, which is the chance that the Serbian government intends to use with the help of the world's largest IT companies. 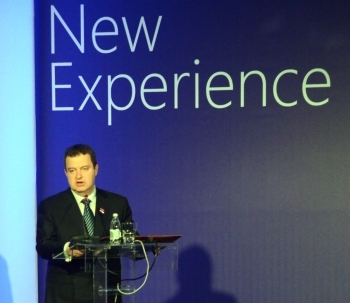 Dacic said at today's meeting with Microsoft CEO Steven Ballmer, which was also attended by First Deputy Prime Minister Aleksandar Vucic, that the government of Serbia has marked the growth and development of the IT sector as a key economic priority, given that this sector can be a stimulus for the country’s economic recovery. The Prime Minister said that our country has a great potential in this area, and recalled that the good cooperation between the Serbian government and the company Microsoft is entering the second decade. Belgrade, 25 Oct 2013 – Prime Minister Ivica Dacic said today that IT sector can be the backbone of the country’s economic recovery and can trigger a new development cycle. Addressing the conference “Microsoft Synergy 13”, Dacic said that at international business forums the Serbian government has been pointing out to Serbia’s four comparative advantages, and added that there is a fifth one now, the IT sector. According to Dacic, the four comparative advantages are energy, infrastructure, i.e., transport corridors, agriculture and the automobile industry. He said that the government has a good cooperation with Microsoft and stressed the importance of Microsoft’s Development Centre in Belgrade, not only because of the professional development of young people from Serbia who can thus pursue their dreams, but also because this fact contributes to the positioning of the company itself. The Prime Minister stressed that the development of IT sector is a priority for Serbia. 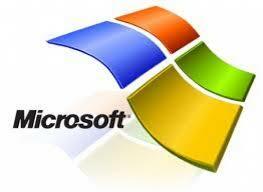 The conference “Microsoft Synergy 13” was organised by the company Microsoft at the Hyatt Hotel. Belgrade, 23 Oct 2013 – Prime Minister Ivica Dacic said today at a meeting with representatives of the IBM that the Serbian government is trying to rationalise and modernise its public administration and to reduce its costs, which is why the state attaches great importance to the introduction of new information technologies. Dacic said that the government is committed to cooperation with the world's largest IT companies, which are expected to help rationalise the public administration affairs. 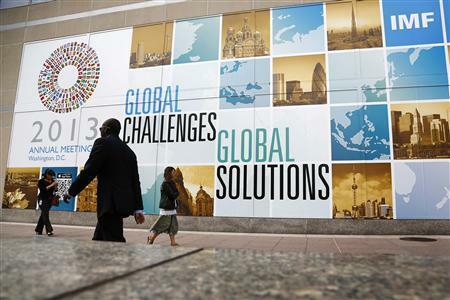 He said that the IBM helped develop analyses to improve productivity and reduce costs of the public administration. 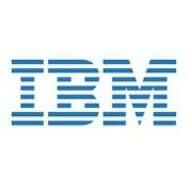 The help of the IBM, which cooperates with a number of European governments, is of great importance for the introduction of e-business in the ministries and other parts of the state apparatus in Serbia, the Serbian Prime Minister said. Belgrade, 18 Oct 2013 – Prime Minister Ivica Dacic and First Deputy Prime Minister Aleksandar Vucic spoke today with representatives of the American company GTECH which is interested in investing in games of chance in Serbia. The Serbian government is open to investments of big international companies and willing to introduce modern technologies in the systems of games of chance. The participants in the meeting examined the possibilities for improvement of business activity of the Serbian State Lottery with the help of GTECH as the world’s leading company in this field with the revenues of €1.5 billion in the first six months of this year. Belgrade, 16 Oct 2013 – Prime Minister Ivica Dacic stated that the Report on Serbia’s progress towards the EU which he received today from Head of the EU Delegation to Serbia Michael Davenport is one the most favourable so far and expressed his hope that the EU accession talks will start in January at the latest. After the meeting with Davenport at the Palace of Serbia, Dacic said that he is satisfied with the grade received and that Serbia will continue with the reforms launched, including dialogue with Pristina. He announced the holding of the first session of the Council for Implementation of the Stabilisation and Association Agreement on 21 October in Luxembourg, to be chaired by EU High Representative for Foreign Affairs and Security Policy Catherine Ashton. Catherine Ashton is doing us a great honour since it is not customary for her to chair those sessions, the Prime Minister stated and confirmed his attendance. He reiterated that Serbia expects the European Commission and European Council to give a positive opinion of the holding of the intergovernmental conference, i.e. for the official start of negotiations. Serbia’s aim is to use negotiations with the EU as an encouragement for reforms, Dacic said and underlined that Serbia’s interest is not only to become a member of the EU, but that Europe comes to Serbia with its criteria and values. According to Dacic, Serbia will continue to work on the fulfilment of criteria and the necessary internal reforms, will consider the existing objections, carry on with dialogue with Pristina and with efforts at stabilising the situation in the region. He described as essentially important an evaluation made in the Report that relations between Serbia and the EU have entered a new phase, that progress has been achieved in the quality of reforms in Serbia and when it comes to stability and cooperation in the region and dialogue with Pristina. As we have announced, our goal is to use EU accession talks as a great boost to the reforms and changes in Serbia so that our country would fulfil criteria not only formally, but as a basis and purpose of the overall transformation of society, Dacic underlined and noted that for that reason these days, months and years are of historic importance for Serbia. Belgrade/Washington, 14 Oct 2013 – Minister of Finance Lazar Krstic stated that Serbia at this moment does not need anything more than a precautionary arrangement with the International Monetary Fund (IMF), but that despite that, the support from international financial institutions is necessary as a proof of credibility of the Serbian government’s policy. Krstic, who is on a visit to Washington together with Governor of the National Bank of Serbia Jorgovanka Tabakovic on the occasion of the annual session of the IMF and World Bank, said in a statement to the Radio Television of Serbia that Serbia wants to enter the talks with the IMF because that would give credibility to the government’s policy, but that the level of foreign currency reserves is such that we do not need more than a precautionary arrangement at this moment. He pointed out that the Serbian delegation, due to a shift in economic policy, encountered positive reactions from senior officials of the IMF and World Bank, noting that our delegation had talks at high level with officials from the US Department of State and the US Department of the Treasury. According to Minister Krstic, the officials of the IMF and World Bank noted that the economic measures of the Serbian government are stimulating for foreign investors. Tabakovic stated that the interlocutors in Washington evaluated positively the middle-term measures of the Serbian government. The Serbian government is coping with the burden of mistakes inherited from the past, but also with the burden of unfulfilled promises to the IMF and international financial institutions, she said. According to her, the three-day talks in the IMF and World Bank mostly focused on the possible new agreement with Serbia and a World Bank programme worth approximately $400 million. In a traffic accident that occurred on the road between Williston and Minot, North Dakota, on 4 October 2013, Vladan Jovanovic was killed, while Dusan Travica and Goran Siparica were severely injured, all nationals of the Republic of Serbia. The Consulate General of the Republic of Serbia in Chicago, which is in charge of this case, reacted promptly and after receiving the information, immediately contacted the friends of victims, talked with the doctors at the hospital in Minneapolis and contacted the respective U.S. police department to get a report on the accident. The official report of the U.S. police stated that the driver was not under the influence of alcohol or any other illegal substance. Immediately upon receiving an official letter from the hospital in Minneapolis, the Consulate General delivered it to the families of those injured to assist them in obtaining a visa for urgent travel to the United States. With the help of the Consular Department of the MFA, father of one of the injured, Andjelko Travica, obtained a U.S. visa in a summary procedure and is due to leave for States on 10 October, where Dusan Travica underwent surgery and is still on life support. The other injured person, Goran Siparica, is in a better condition. Following the accident, the Ministry of Education, Science and Technological Development, issued a statement in which, among other things, it is stated that condolences were sent to the family of the young student who was killed. Belgrade/New York, 4 Oct 2013 – Prime Minister Ivica Dacic today expressed belief that Serbia will be next, the 29th member of the EU, in the next ten-year period. 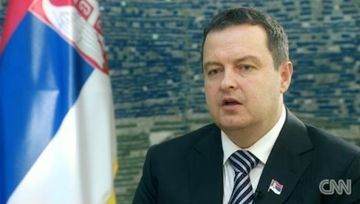 In an interview with TV network CNN Dacic said that Serbia wants to join the EU as soon as possible. We believe that this is what both Serbia and the EU need, he said. Asked how he sees the solution for Kosovo issue, Dacic admits that it is not easy to find a solution for Kosovo, especially at this stage where things have gone too far. A much better and more just solution could have been reached earlier, avoiding both a war and the tensions created in the region. However, this is not a part of our dialogue today, Dacic said. We would like relations to be normalized, we would like to reach a final solution, he says, adding that Serbia cannot and will not bring its problems with it into the EU. This is also another reason why we are conducting this open dialogue with Pristina in order to normalize the relationship and solve our problems before accession to the EU, he underscored noting that this does not mean a change in policy when it comes to the issue of recognising the independence of Kosovo. The Prime Minister underlined that Serbia wants to protect and nurture the old alliances and friendships, such as the ones with Russia and China, reanimate old friendships with countries such as the United Kingdom, United States or France, but also make new friends, friends Serbia may not have had in the past, like Germany. The Prime Minister said that there is no time to waste, because the economy suffered serious consequences after the breakup of Yugoslavia, during the 1990s. Unemployment is the biggest problem, Dacic said, adding that the debate on economic reforms in Serbia is meaningless if there is no increase of industrial production, and therefore the standard of living. 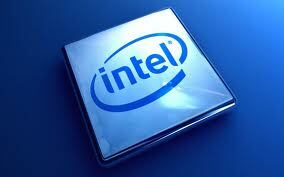 The only way to achieve this is to increase foreign investment, he stated. But that will not happen if Serbia is not part of the modern world, Dacic said. Dacic said that Serbia does not see the process of accession to the EU only as a financial aid package and the opportunity for the citizens of Serbia to work in other countries across Europe, but primarily as a magnet for foreign investors. Asked if he thinks whether the free trade agreement with Russia could be a sort of a European gateway to the East, he said that Serbia has always been "East to West and West to East." We were always somewhere in between. And that is why the EU is the main strategic goal for Serbia, Dacic said. Dacic said that the majority of Serbian citizens support European integration as they believe that it is in the interest of the country to be part of the developed world. Serbia should not be prisoner of its own past, but must look to the future, he concluded. The Republic of Serbia welcomes the adoption of UN SC Resolution on chemical weapons in Syria 2118 (2013), based on the decision of the Executive Council of the Organization for the Prohibition of Chemical Weapons. The Resolution, based on the agreement reached between the Russian Federation and the United States, strongly expresses the consent of the international community that the use of chemical weapons is unacceptable, and constitutes a key step towards creating the possibilities for the safe and stable future of all citizens of Syria. The Republic of Serbia expresses its hope that the elimination of chemical weapons in Syria will be followed by strong diplomatic efforts aimed at putting an end to violence and reaching a sustainable solution. In Partnership with the Global Language Network, New York University, Washington DC will be hosting G-Fest, an international festival that will be open to the general public and free of charge. G-Fest showcases ethnic and cultural diversity, celebrating unique worldly traditions, encouraging cultural exchange and understanding. Featuring interactive country booths, dance performances, cultural displays, and more, G-Fest will allow students and guests the opportunity to learn the customs of our friends around the globe. Join us for an afternoon of language, culture, food and fun! Belgrade/New York, 23 Sept 2013 – The Office for Cooperation with Diaspora and Serbs in the region announced that a statue of Nikola Tesla will be unveiled in New York today, marking 70 years since the scientist’s death. The monument will be unveiled in front of the only preserved building where Tesla worked at Long Island, in New York State, and the event will be attended by Serbian President Tomislav Nikolic. The unveiling of the monument, authored by Nikola Jankovic, starts at 12 p.m.
Belgrade, 23 Sept 2013 – Prime Minister Ivica Dacic met with representatives of American IT company EMC and said that Serbia is interested in the rapid development of information technology. During the meeting it was stated that the Serbian government supports the development of the IT sector and that Serbia has qualified staff and good conditions for foreign companies in the sector. One of the biggest IT companies in the world, EMC, has been operating in Serbia for six years and is interested in new investments in the production, development, as well as in the field of storage, data protection and management of electronic documents, it was said at the meeting. Prime Minister Ivica Dacic sent a telegram of condolence to Prime Minister of Lithuania Algirdas Butkevicius following the death of Lithuanian customs officer Audrius Senavicius, who was killed in this morning's attack against EULEX in the north of Kosovo-Metohija. "On behalf of the government of the Republic of Serbia and myself, please accept our deepest condolences over the death of the Lithuanian officer who was killed in this morning's attack on EULEX. The Serbian government will do everything to help identify the perpetrators of this crime, reads the telegram. Prime Minister Ivica Dacic and EU High Representative for Foreign Affairs and Security Policy Catherine Ashton condemned in the harshest terms this morning’s attack on members of the EULEX in northern Kosovo-Metohija. In a telephone conversation which Dacic had with Ashton today about the situation in Kosovo-Metohija, he underlined that the Serbian government will give its utmost contribution to finding the perpetrators of this attack. The Prime Minister pointed out that the attack on the EULEX is directed against interests of Serbs in Kosovo-Metohija and is contrary to efforts of the Serbian government aimed at helping stabilise the situation in the province. Dacic and Ashton noted during their conversation that it is necessary to make even greater efforts to further normalise relations in Kosovo-Metohija. 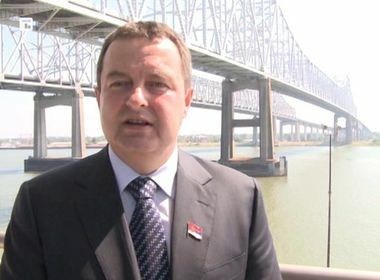 Belgrade/New Orleans, 18 Sept 2013 – Prime Minister Ivica Dacic said that trade between Serbia and the United States is constantly rising and currently exceeds €300 million, but it could double by the end of the year thanks to exports by Fiat. At the end of his visit to New Orleans, Dacic told Tanjug he is pleased with the visit, which focused on a business conference for US companies interested in investing in Serbia. The conference “Invest in Serbia – New Orleans 2013” was attended by more than 35 companies and resulted in important contacts being established, creating options for cooperation between the two countries in mining, energy and ship building, he said. Dacic stated he met during his stay in New Orleans with officials of companies interested in investing in Serbia, pointing out Freeport, which is already surveying ore deposits in Bor, east Serbia, Chevron, which is interested in oil shales deposits, and General Electric, which could invest in the Serbian railways. It was agreed that Freeport officials would come to Serbia. They already invest around €15 million a year to survey the area around Bor for any ore deposits, and the goal is to get that figure up to €25-40 million next year, Daic said. General Electric is interested in building or buying a factory that would make train engines and train cars for Southeast Europe, the prime minister noted. 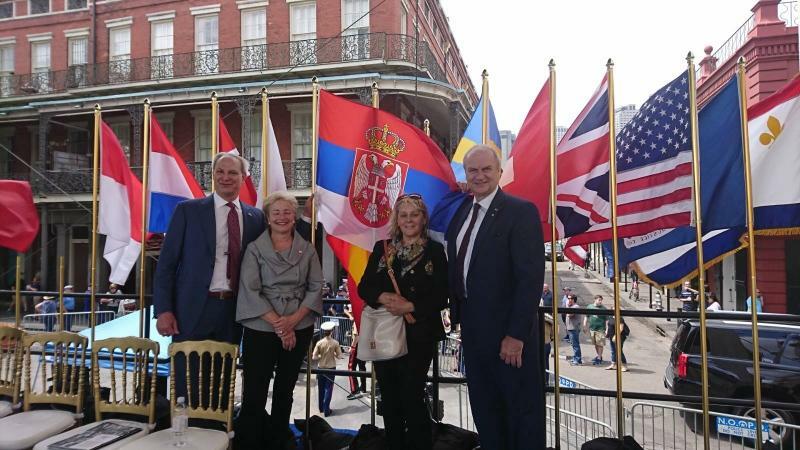 During his stay, he visited the port of New Orleans, which is one of the largest ports in the world, and said that Serbia's honorary consul Greg Rusovic, who had helped establish contacts with US companies, was one of the top people there. We agreed for Rusovic to come to Serbia with an expert team and see what could be done. 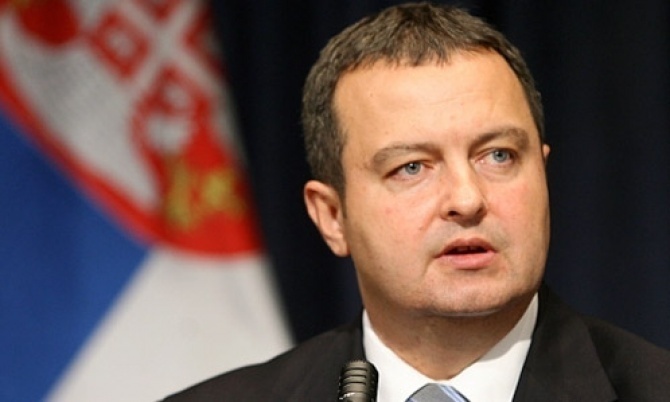 Serbia is using little of the Danube's potential, especially for the industry, Dacic added. 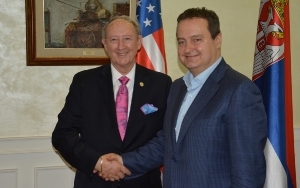 During his visit to the United States, Dacic met with New Orleans Chief of Police Ronal Serpas, who will preside over the International Association of Chiefs of Police in 2015. 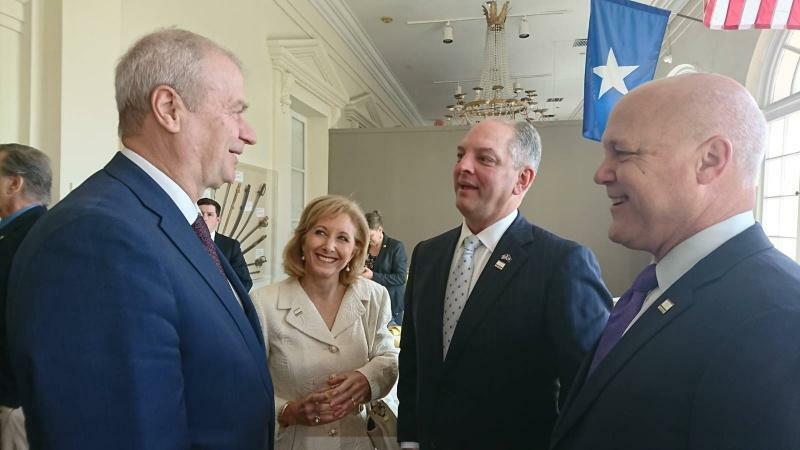 Belgrade/New Orleans, 17 Sept 2013 – Prime Minister Ivica Dacic said at the US-Serbian Business Forum "Invest in Serbia", held in New Orleans, that Serbia is a reliable and safe destination for investors. Dacic presented investment opportunities in Serbia and changes that are to take place, such as the cutting of red tape and tax reform. The forum was attended by around 50 companies, and the Prime Minister spoke with representatives of the leading companies in the field of ore extraction, such as Freeport-McMoRan Copper and Gold Inc. and Chevron's North America Exploration & Production. Freeport has gone the longest way in cooperation with Serbia as it already conducts research on the extraction of ore discovered in our country, Dacic said. According to him, Chevron is interested in the exploitation of oil shale near Aleksinac. Mayor of New Orleans Mitch Landrieu welcomed this direct way of attracting investment and offered a long-term economic cooperation. He said that the United States and Serbia have many common interests, which is why it is necessary that the United States improve cooperation through their cities. 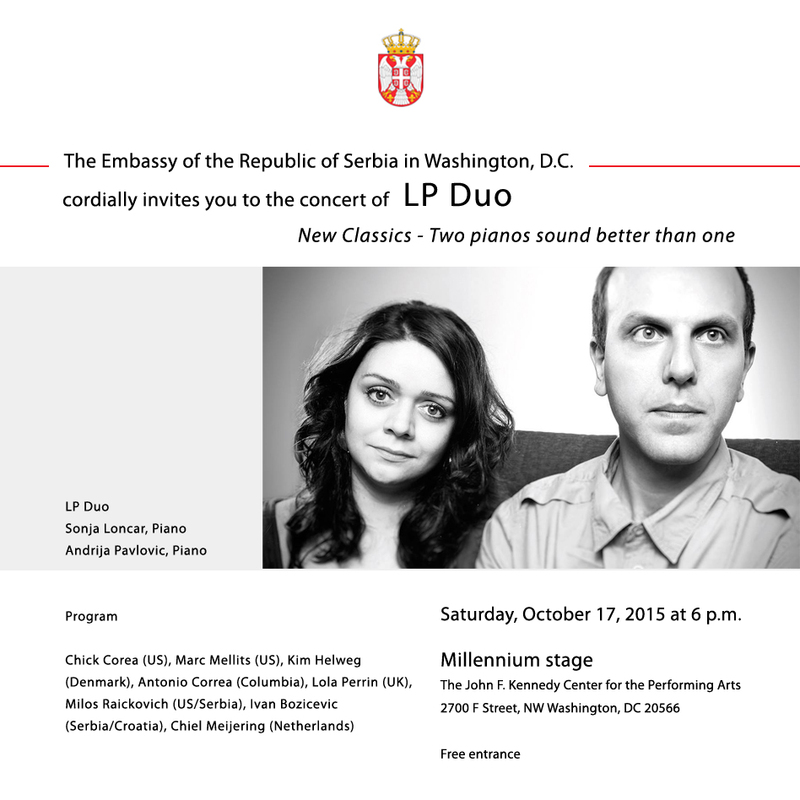 The Embassy of Serbia and the John F. Kennedy Center for the Performing Arts have the pleasure to present young Serbian artists Ms. Anđela Bratić (flute) and Ms. Jasna Popović (piano) at the concert at the the John F. Kennedy Center on September 18, 2013 at 6 p.m.
Anđela Bratić was born in Niš, graduated from the Faculty of Music Arts in Belgrade, completed her master studies at the University of Mainz in the class of Professor D. Gavrić. She pursued professional advancement at courses held by eminent flautist and professors Irena Grafenauer, Janos Balint, Yossi Arnheim and Dieter Flury. She is the winner of several national and international awards. 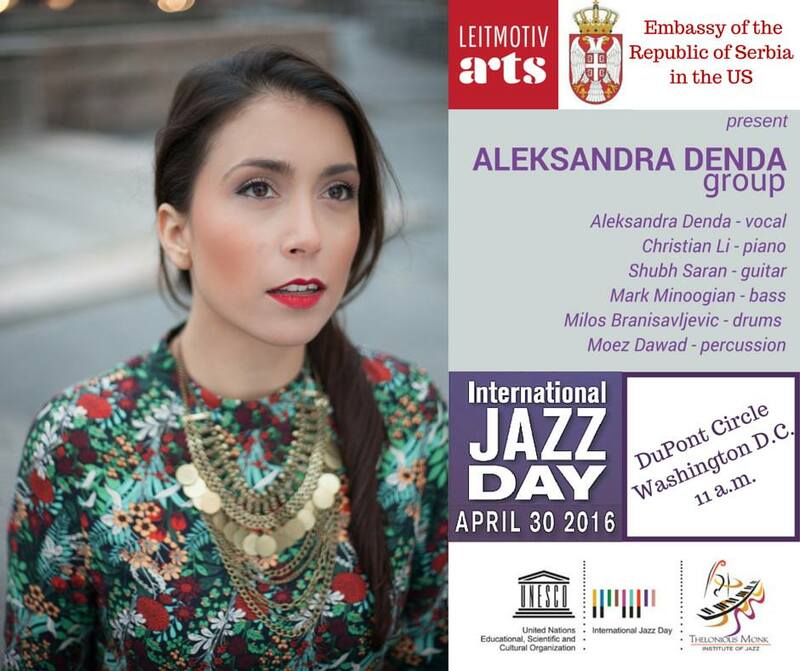 Since 2009 she has been assistant professor for flute at the Faculty of Arts in Niš. Jasna Popović was born in Belgrade, where she received her first piano lesson at the age of six. Popović attended the Hochschule für Musik und Theater in Munich, Germany. She has won numerous awards such as Passantino Award for Special Achievements from the City University of New York in 2006. This academic recognition was followed by a series of successful performances at Weill Recital Hall/Zankel/Stern Perlman Auditorium at Carnegie Hall, United Nations, Steinway Hall, Lefrack Hall and throughout the Europe, Asia and South America. Jasna Popović is Bechstein artist residing in New York City. Belgrade/Brussels/Washington, 28 June 2013 – President of the European Council Herman van Rompuy stated today that EU leaders decided that the accession talks with Serbia should start by January 2014, which is a historic moment for the Balkans and Europe as a whole. Van Rompuy underlined at a press conference that there are no new conditions for the start of negotiations and announced that in January 2014 an inter-governmental conference with Serbia will be held, by which negotiations on EU membership will be opened formally. He also announced his visit to Belgrade on 1 July during which he will highlight the importance of the progress made in the process of European integration. President of the European Commission Jose Manuel Barroso welcomed the decision to set the date for the start of negotiations with Serbia, describing it as a historic event. Prime Minister of Serbia Ivica Dacic said that the European Council's decision to open accession talks with Serbia is final and historic and that there are no new conditions set. The meeting of the governments of all 28 EU member states will be held in January at the latest, at Germany's request, the Prime Minister announced. Serbian Minister of Foreign Affairs Mr. Ivan Mrkic said that European Council’s decision has confirmed that Serbia conducts responsible policy. He reiterated that Serbia is finally entering an irreversible process of becoming member of the European family. Minister Mrkic emphasized that Serbian Government has ensured present and future for Serbian people in Kosovo and Metohija, while at the same time it has opened a door for friendship with Albanians and all other nations that share this region where we all live. Belgrade, 4 June 2013 – First Deputy Prime Minister responsible for defense, security and the fight against corruption and crime and Minister of Defense Aleksandar Vucic spoke today with US Deputy Assistant Secretary of Defense Evelyn Farkas. Vucic expressed satisfaction with the cooperation with KFOR and the United States’ decision to keep the present level of troops in Kosovo-Metohija. The First Deputy Prime Minister informed Farkas about the elements of the agreement reached between Belgrade and Pristina in Brussels and the plan for its implementation. He also noted that bilateral military cooperation between Serbia and the United States is at a high level. Farkas stated that the United States supports reforms and European integration of Serbia and added that the agreement between Belgrade and Pristina is a brave and pragmatic decision which will contribute to a better future of Serbia to a large degree. She underlined that the United States will not withdraw its troops from KFOR until the conditions for that are created. The Embassy of the Republic of Serbia has the pleasure to present exhibition "Walking towards spring" by Sanja Pesic Ostojic June 06 – June 20, 2013 Opening of the exhibition will be on June 06, 2013 from 6, 30 to 8, 30 pm at the Embassy of the Republic of Serbia 2134 Kalorama Rd. NW Washington, DC 20008. The exhibition will be open until June 20 2013 during the working hours of the Embassy. On Assistant Foreign Minster of Serbia Ljubica Vasić will discuss the challenges and opportunities that the Republic of Serbia faces on its path to European integration. She will address key reforms that the country has introduced so far to advance its EU accession bid and will explain why the European integration process is important for the overall development of the country,. She will outline the steps that Serbia has taken to achieve one of its main foreign policy goals – EU membership. Baltimore, May 24, 2013. - First shipment of 3.200 Fiat 500L cars, manufactured in Serbia, has reached Baltimore today. H.E. Vladimir Petrović, ambassador of Serbia to the US, former congresswoman Helen Delich Bentley, as well as representatives of “Fiat” and Port of Baltimore were present while first cars were unloaded. In his statement to media, ambassador Perović said he was very pleased with the arrival of the shipment and pointed out that this could be an incentive for exports of other Serbian products to US. 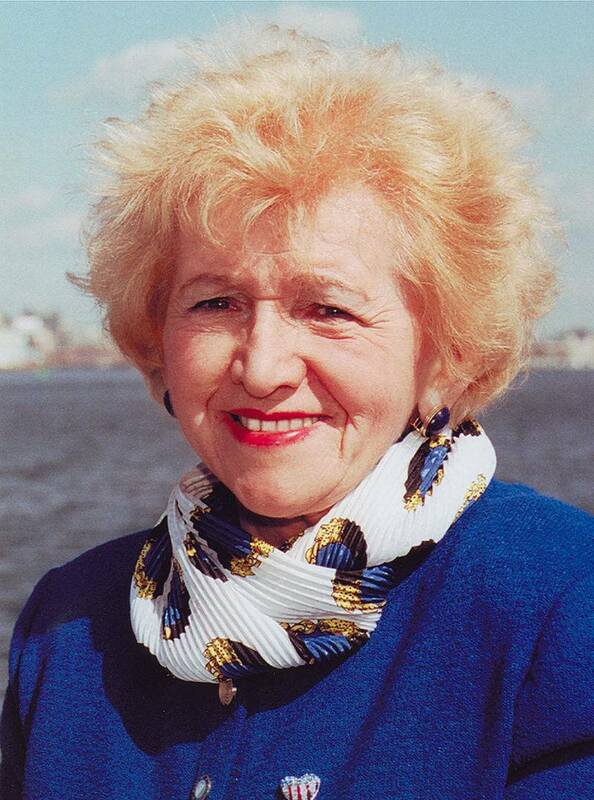 “I’m very happy that today we are in the Port of Balitmore, named after congresswoman Helen Delich Bentley, who is of Serbian origins. First shipment of Fiat 500L cars has arrived to US. Cars were manufactured in my hometown of Kragujevac. This is great day for Serbian exports”, he added. 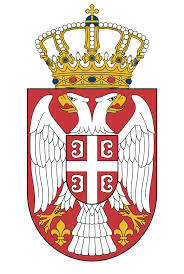 Excellency, I and the citizens of the Republic of Serbia have been deeply saddened by the news of a tragic loss of life and enormous destruction left in the wake of a massive tornado which hit Oklahoma City on May 20, 2013. Even at this sad hour, I would like to convey to you that the people of Serbia sympathize with the families of victims and the people of the United States of America. Please accept, Excellency, my most profound condolences and may I ask you to offer our heartfelt sympathies to the bereaved families. Meeting between H.E. Ambassador Vladimir Petrović with Secretary General of the OAS, H.E. José Miguel Insulza Washington, May 21, 2013 - H.E. Ambassador Vladimir Petrović met today with Secretary General of the Organization of American States, H.E. José Miguel Insulza. Ambassador Petrovic informed Secretary General about current developments in Serbia and Serbia’s foreign policy priorities. Two officials also discussed upcoming 43. Session of the General Assembly of the Organization of American States, to be held in Guatemala, June 4-6, 2013. May 15, 2013 Readout of Vice President Biden’s Meeting with Serbian Prime Minister Ivica Dacic Vice President Biden met with Serbian Prime Minister Ivica Dacic this afternoon in Washington. The Vice President reiterated the United States’ commitment to a strong and growing bilateral partnership with Serbia. The Vice President congratulated Prime Minister Dacic on reaching an initial agreement in the EU-facilitated Dialogue to normalize Serbia’s relationship with Kosovo. This agreement holds the promise of advancing the European aspirations of both countries and securing a peaceful and prosperous future for their citizens. Prime Minister Dacic and his government showed leadership and conviction in taking this important step. The Vice President underscored the importance of Serbia and Kosovo moving forward expeditiously to meet their Dialogue commitments and to implement the agreement in full. The Vice President encourages both Serbia and Kosovo to take this historic opportunity to move their countries forward. Wasington, DC, May 15 2013, During his visit to the United States, Prime Minister Ivica Dacic will on 15 May 2013 meet with US Deputy Secretary of State William Burns and with Vice President Joseph Biden. Serbian PM Dacic to visit US major IT companies Washington, May 13, 2013 – Prime Minister and Minister of the Interior Ivica Dacic, who is on a visit to the United States, will meet today with the management of the company Hewlett Packard and will attend a presentation of the emergency response system. Dacic will also visit PayPal and Oracle and discuss the investment opportunities in Serbia with the leading companies in the field of IT. The Prime Minister will speak at a seminar on investment in Serbia and branding.